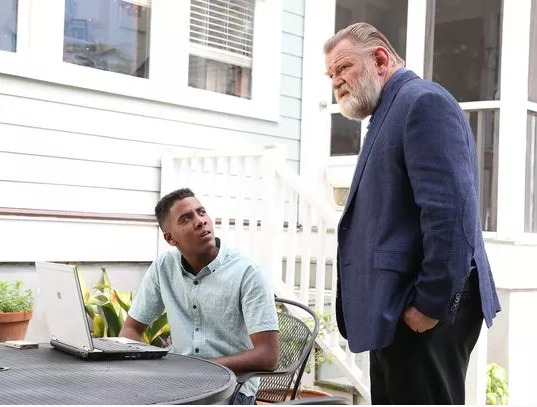 Mr Mercedes has added three guest stars for the third season. “Mr. Mercedes” has added three recurring guest stars to the upcoming third season on AT&T Audience Network. 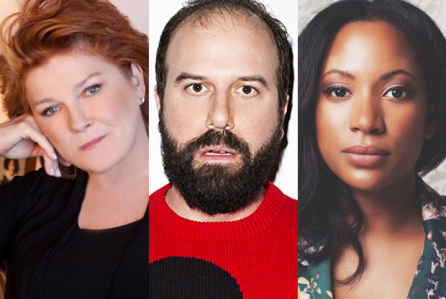 Kate Mulgrew will play Alma Lane, a lifelong resident of Bridgton, Ohio; Brett Gelman is Roland Finklestein,a passionate defense attorney Lou Linklatter (Breeda Wool) in her murder trial; and Natalie Paul will play Sarah Pace, a prosecutor on Lou’s case. 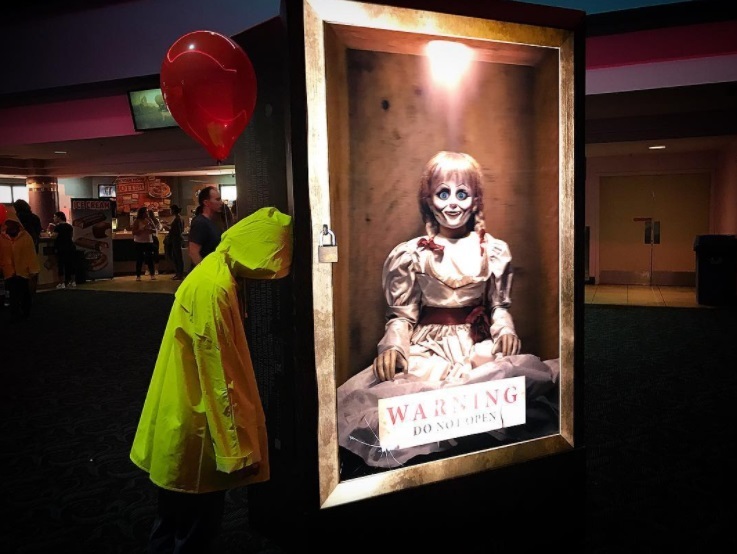 The series is based on author Stephen King’s Bill Hodges trilogy, and the third season will closely follow the second book “Finders Keepers,” exploring the fallout from Brady Hartsfield’s (Harry Treadaway) massacre. 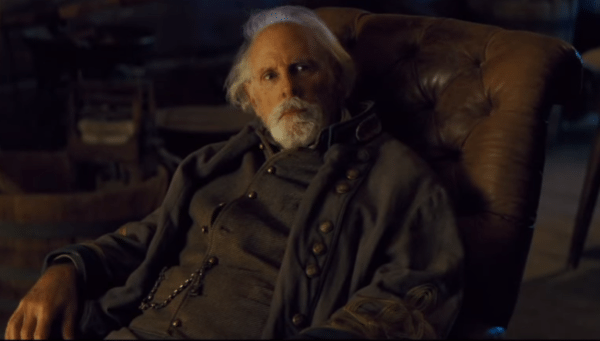 Oscar-nominated actor Bruce Dern has been cast as John Rothstein in the third season of Mr. Mercedes. Seems like casting for season 3 of Mr Mercedes is happening right now. 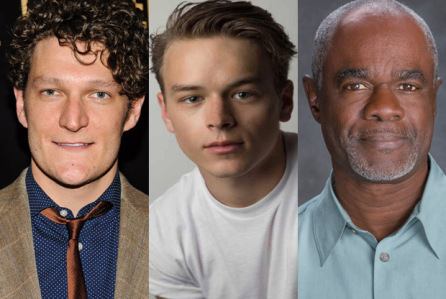 Gabriel Ebert (Ricki and the Flash) and Rarmian Newton (Rise) are set as series regulars and Glynn Turman (How To Get Away With Murder) will recur on the upcoming third season of AT&T Audience Network’s critically praised drama series Mr. Mercedes, from Sonar Entertainment. 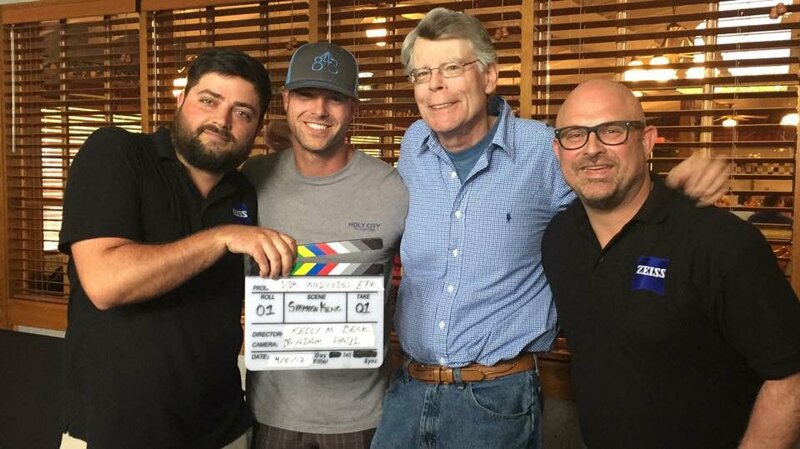 Production on the Stephen King adaptation is underway in Charleston, South Carolina. Ebert will play Morris Bellamy, intelligent, well-educated if not middle class, a volatile and charismatic wolf in sheep’s clothing. When he was younger he had ambitions of becoming a famous writer but ended up with a much less exciting life in Ohio. Newton plays Peter Saubers, 16, smart and personable, he’s a junior in high school and on the college track. From a seemingly happy home, but that picturesque Midwestern life was derailed when his father was disabled during the Mr. Mercedes massacre. Turman recurs as Judge Bernard Raines, the no-nonsense judge presiding over Lou Linklatter’s murder trial, he suffers no fools and takes no prisoners. He is none too pleased with the lawyers working on this case who seem hell bent for trial. 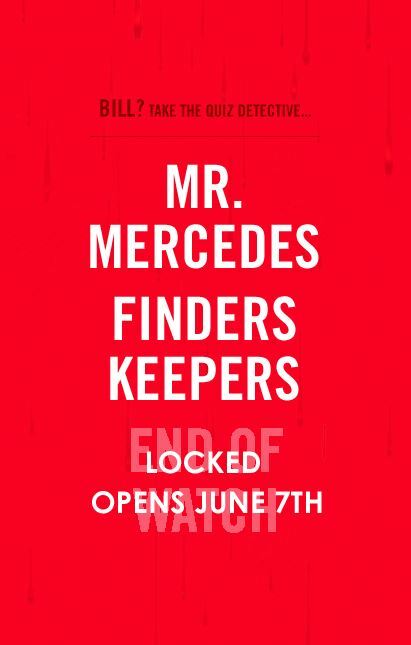 According to Bleeding Cool the third season of Mr. Mercedes will be based on second book in the series, Finders Keepers. The season will be 10 episodes long and so far, there has been no information about if Brady will be present in the season or not. 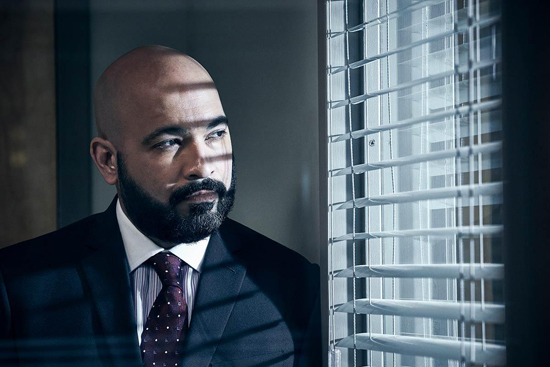 Jonathan Havird worked as an extra on season two of Mr. Mercedes and I got a chance to sit down with him and talk about what it means to be an extra in a TV show. Here is what he had to say. 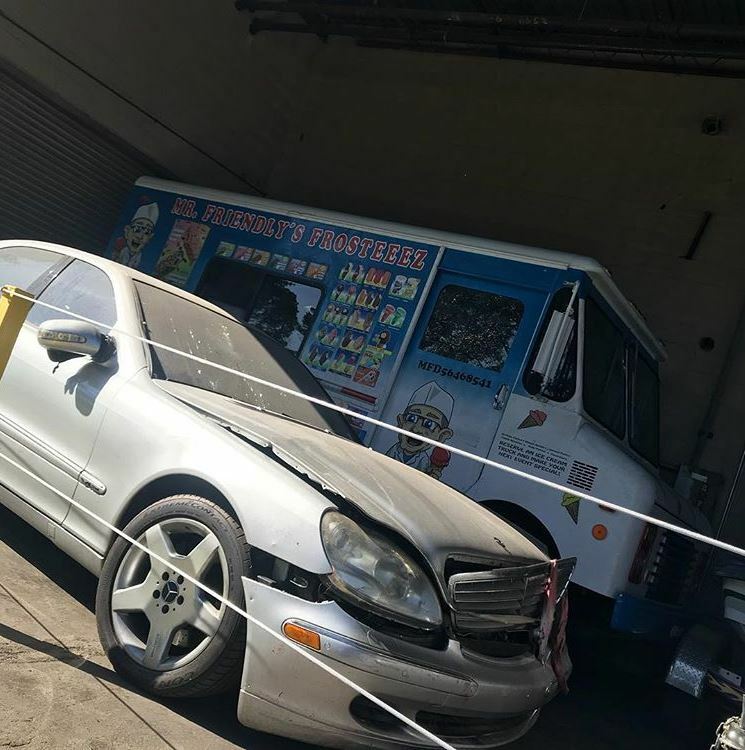 Mr Mercedes Season 3 Based On End Of Watch? 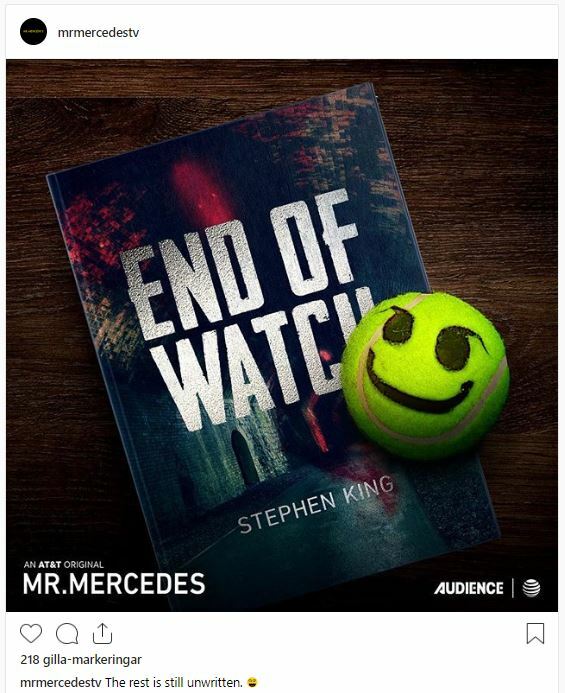 Looks like season 3 of Mr Mercedes might be based on End of Watch. Here are my thoughts about the season 2 finale of Mr. Mercedes. Here are my thoughts about the eight episode of season 2 of Mr. Mercedes. It’s interesting that even though Bill is in quite a lot of pain he still chooses to half lay half sit on the couch to sleep. Seems like a bed would be much more comfortable. Here are my thoughts about the seventh episode of season 2 of Mr. Mercedes. I like Dr. Babineau but his wife I don’t really care for. She is a very flat character that you don’t like or dislike (even if it’s more of the later). You just don’t care about her. Here are my thoughts about the sixth episode of season 2 of Mr. Mercedes. Once again a good episode. The plot moves along in a steady pace and I like that. Things are happening but not rushed. Here are my thoughts about the fifth episode of season 2 of Mr. Mercedes. Here are my thoughts about the fourth episode of season 2 of Mr. Mercedes. Here are my thoughts about the third episode of season 2 of Mr. Mercedes. I like the season but I also think that it needs to start. It needs more action. I’m all for letting us know the characters and the mood they are in but we know the characters, we know what their agenda is. Now we need to see it happen. Here are my thoughts about the second episode of season 2 of Mr. Mercedes. 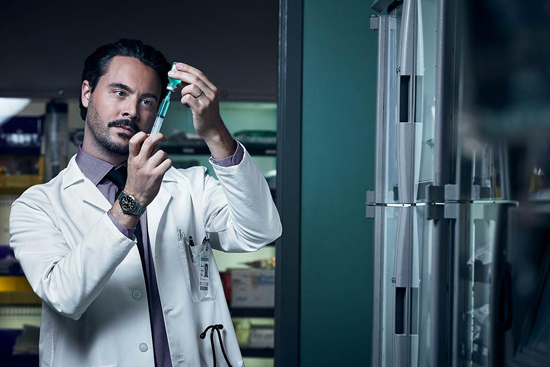 I like Jack Huston who plays Felix Babineau. He is a great actor and here he works perfect! Here are my thoughts about the first episode of season 2 of Mr. Mercedes. 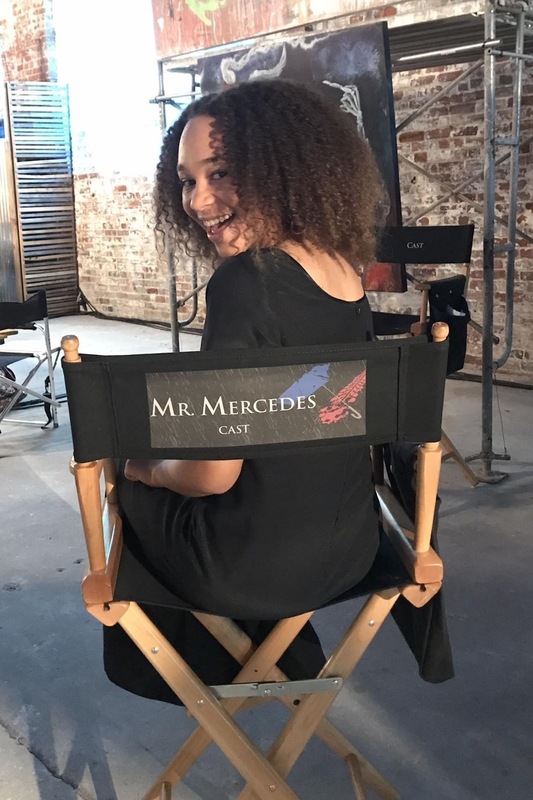 Just in time for the premier of season 2 of Mr. Mercedes I got to do a short interview with Makayla Lysiak who plays Barbara, Jerome’s little sister. We talk about how she prepared for the role and what she thinks of Stephen King. 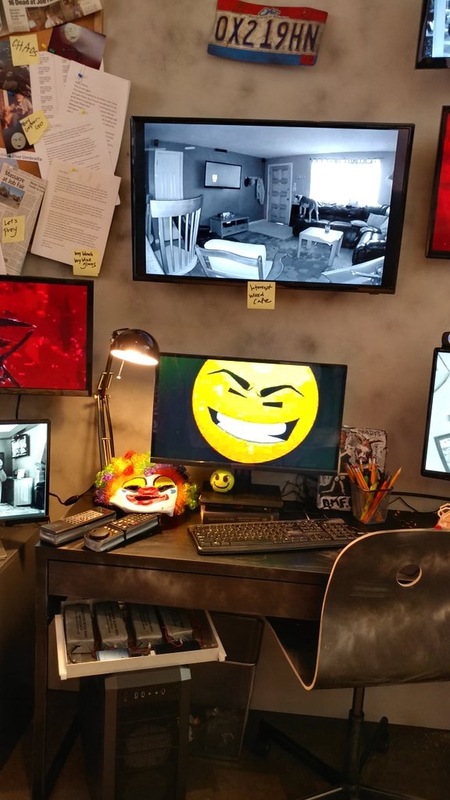 Also check out my interivew with Rob Kyker; propmaster on Mr. Mercedes. 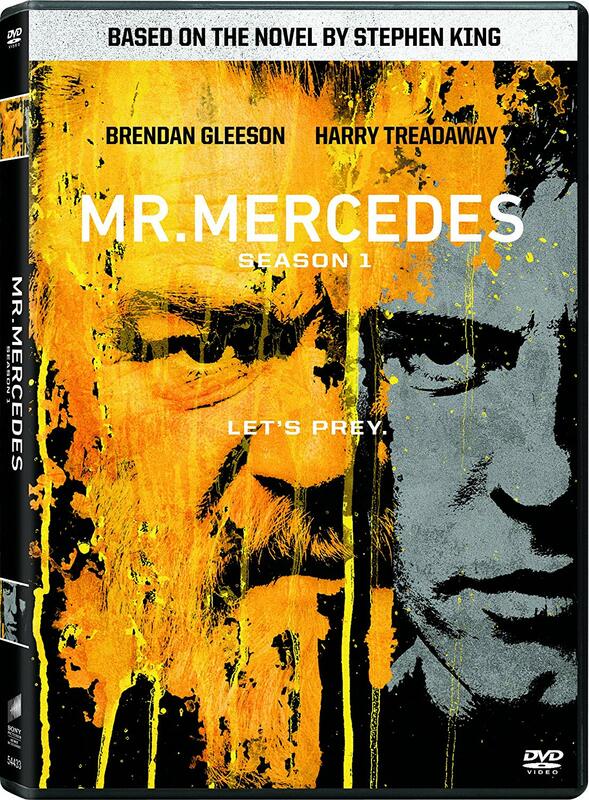 Mr Mercedes Season 1 DVD Out Today! 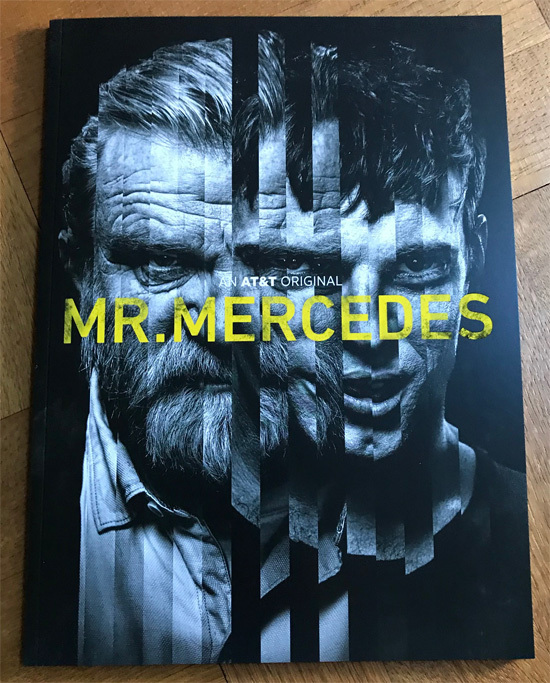 Today Mr. Mercedes is released on DVD in the US. Get your copy here. 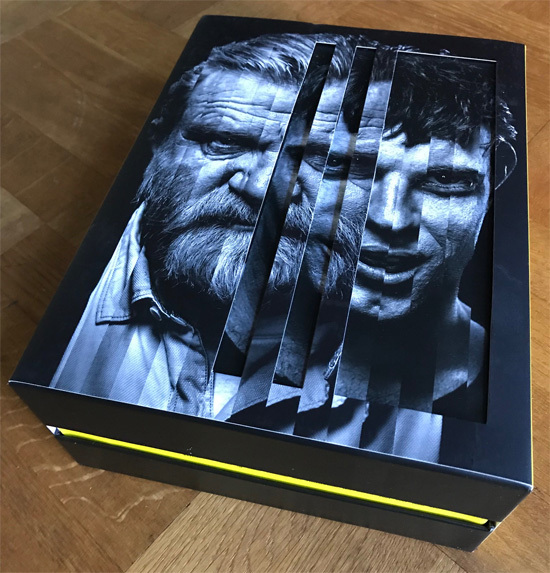 Here are some photos of the great press kit for season 2 (premiers August 22) of Mr. Mercedes. The press kit box is pretty big. ...there is a book with info and a DVD with the first two episodes. A scan of Brady's brain. 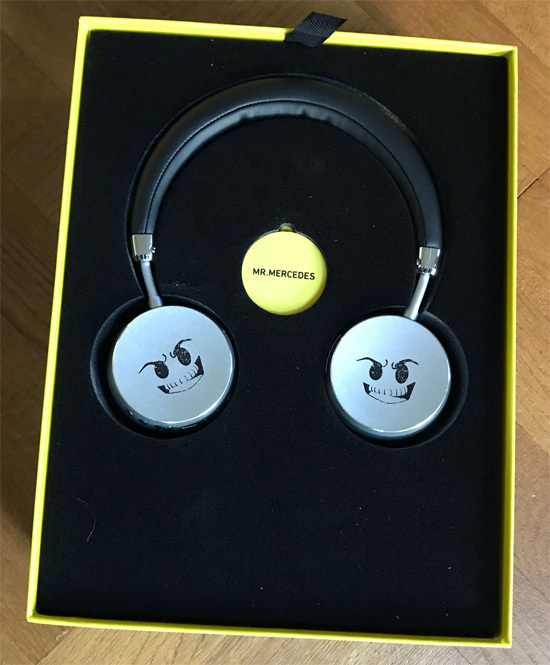 Wierless headphones and a USB. And a case to keep the headphones in. 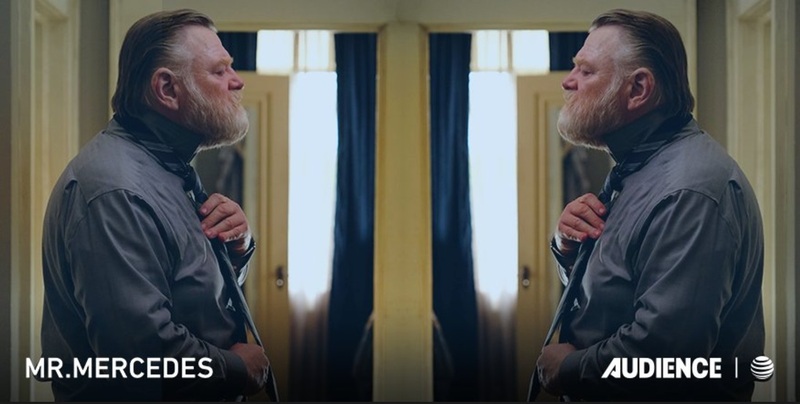 Brendan Gleeson talks about season 2 of Mr Mercedes. 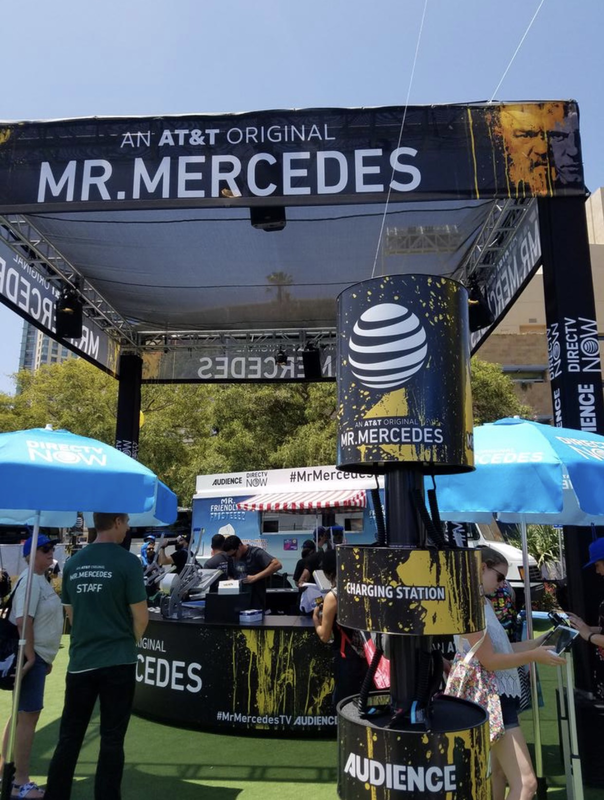 Here is a video from the Mr. Mercedes Immersive Experience Highlights from San Diego Comic-Con 2018. 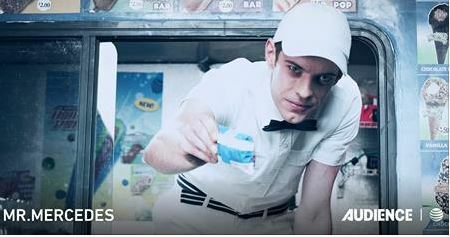 Here is a trailer for season 2 of Mr. Mercedes. "We definitely, hopefully, will have a third season. (Story-wise) the door is wide open." - Director Jack Bender while promoting the second season of Mr. Mercedes at Television Critics Association. On August 14 Mr Mercedes will finally be out on DVD in the US. Order your copy here. 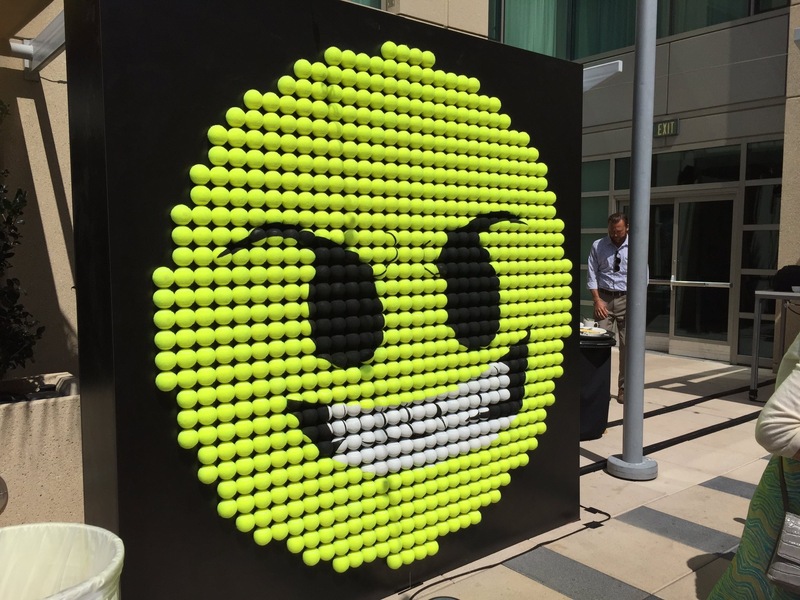 Syfy Wire reports from the Mr. Mercedes pannel at Comic Con. And while trilogy is the key word here, the new season of the show will not be drawn from the second book in the series, Finders Keepers, but the third and final book, End of Watch. The problem with using Finders Keepers, said executive producer/director Jack Bender, was that "our heroes didn’t come into it until halfway through the book." Even though the words "Finders Keepers" are included in the season, the main action is taken from the trilogy capper. Just prepare yourself for things to get a little stranger, “a little what the f*** are you talking about?" Bender said. 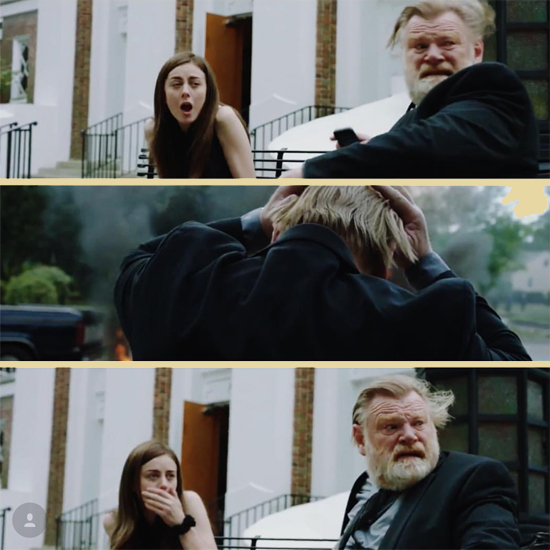 Can you imagine being responsible for anything that an actor touches in a TV show like Mr. Mercedes? 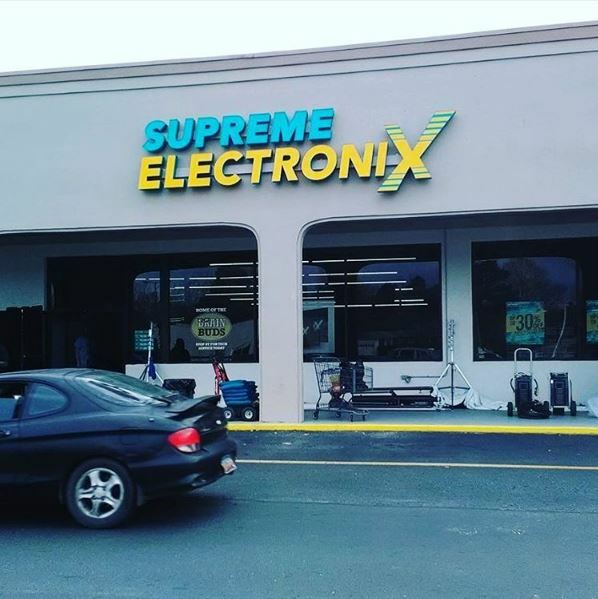 Everything from guns, food, watches, cell phones, animals, pictures and cars? For Rob Kyker that is just another day at work as he’s the prop master on the show. 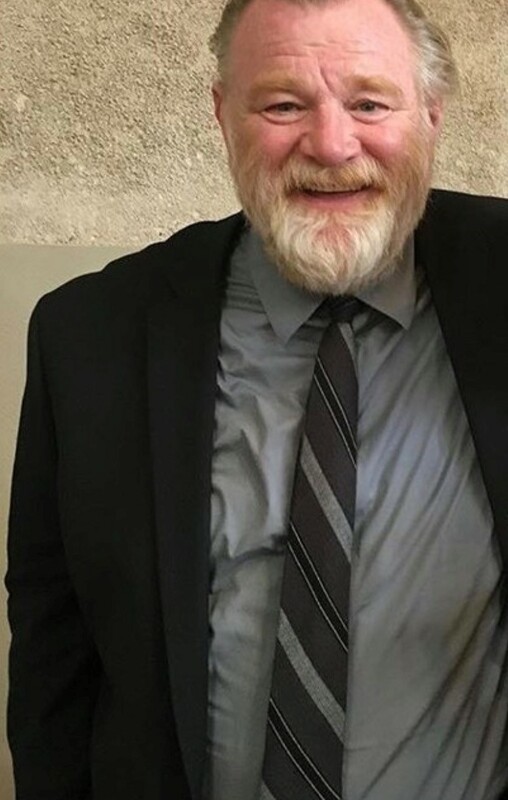 I got the chance to talk to him a bit about his work on Mr. Mercedes and here is what he had to say. 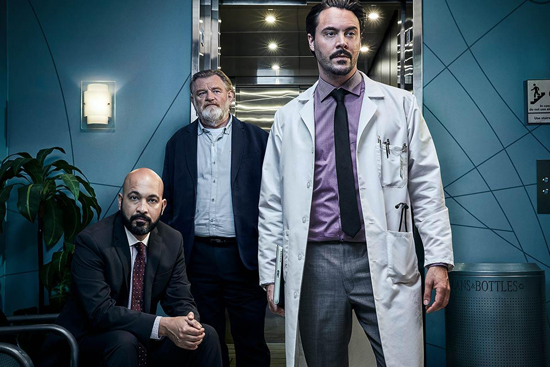 And here are more cast photos from season 2 of Mr Mercedes. 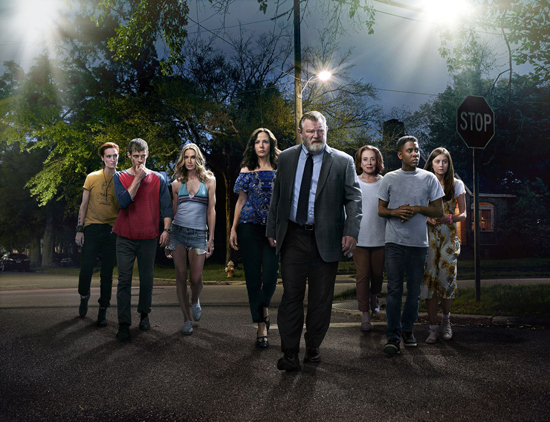 Here are some cast photos from season 2 of Mr Mercedes. Here is a plot summary for season 2 of Mr Mercedes. 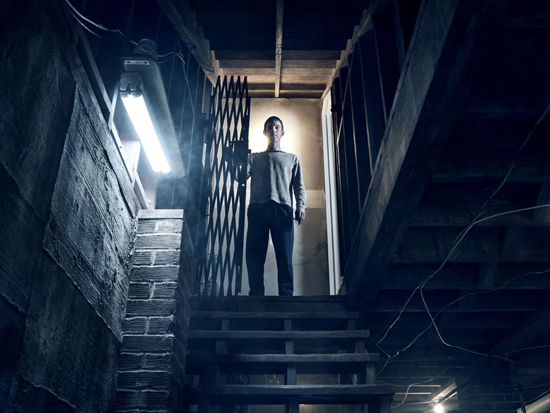 The series picks up a year after Brady Hartsfield's thwarted attempt to perpetrate a second mass murder in the community of Bridgton, Ohio. 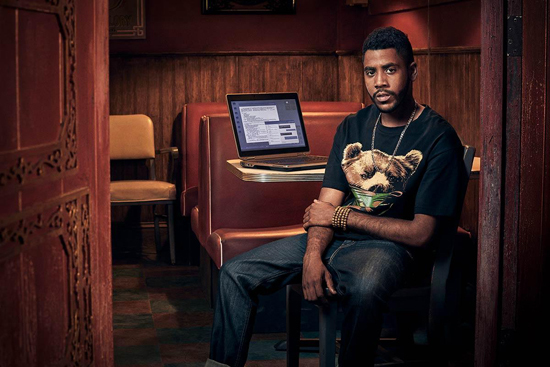 Since the incident, Hartsfield has been hospitalized in a vegetative state. Retired Detective Bill Hodges has done his best to move on from his Brady obsession, teaming up with Holly Gibney to open Finders Keepers, a private investigative agency. But when unexplainable occurrences begin to affect hospital staff members attending to Brady, Hodges is haunted by the feeling that Brady is somehow responsible. The original cast, which includes Brendan Gleeson ("Harry Potter") as Detective Bill Hodges, Harry Treadaway ("Penny Dreadful") as Brady Hartsfield, Jharrel Jerome ("Moonlight") as Jerome Robinson, Scott Lawrence ("Avatar") as Detective Peter Dixon, Breeda Wool ("Unreal") as Lou Linklatter, Justine Lupe ("Francis Ha") as Holly Gibney, Nancy Travis ("How I Met Your Mother") as Donna Hodges, and Holland Taylor ("The Truman Show") as Ida Silver, is joined by Jack Huston ("Boardwalk Empire") as Brady Hartsfield's doctor Dr. Felix Babineau, Tessa Ferrer ("Grey's Anatomy") as Dr. Babineau's wife Cora Babineau, and Maximiliano Hernandez ("Sicario") as Assistant DA Antonio Montez for season 2. 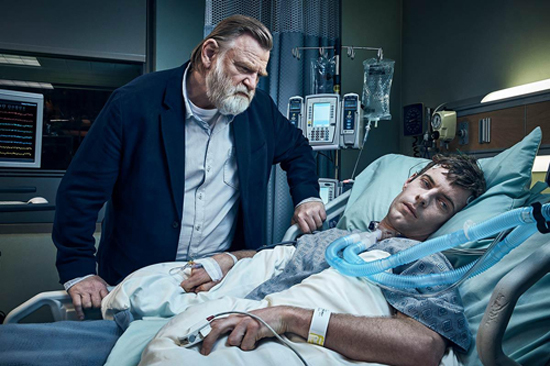 Season 2 of "Mr. Mercedes" will premiere on AT&T AUDIENCE Network on Wednesday, Aug. 22 at 10 p.m. ET/PT. Here is the poster for season 2 of Mr Mercedes. It premiers August 22. Mr Mercedes IS Finally Coming To DVD! 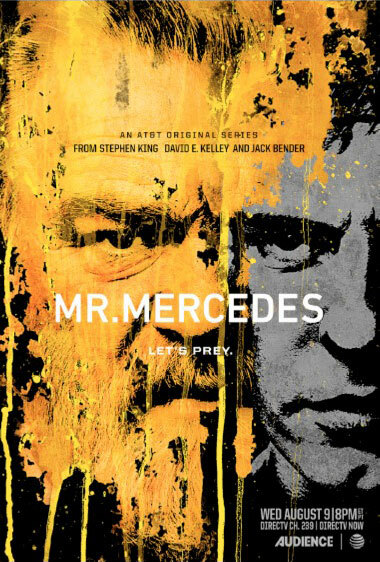 Amazon now has season 1 of Mr Mercedes listed for August 14. Order your copy here. 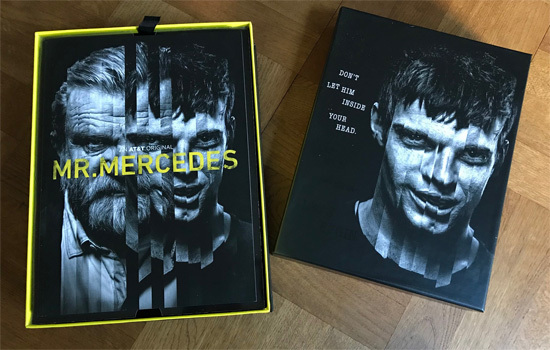 Is Mr Mercedes Finally Coming To DVD? 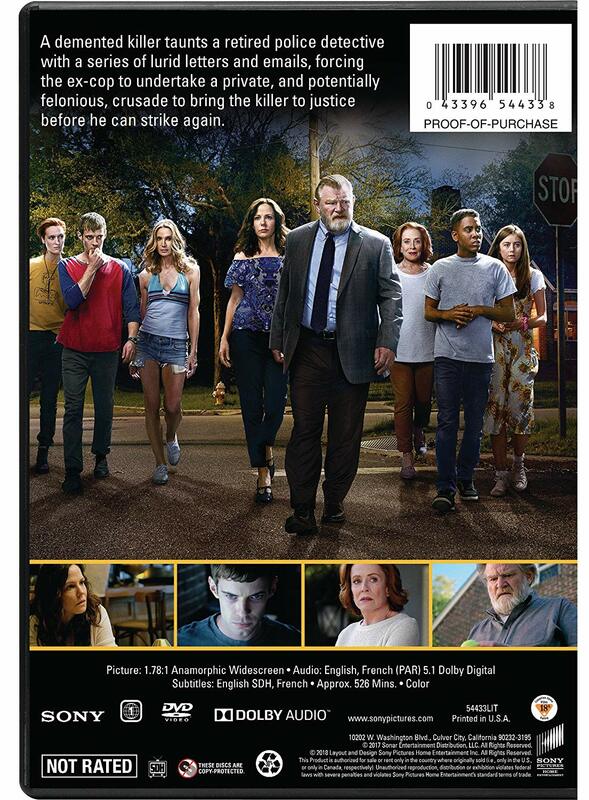 A couple of DVD sites has announced that season 1 of Mr Mercedes will be released on August 14. This is not listed on Amazon.com though (and that makes me a bit doubtful) but still, the date makes sense with the second season premiering on August 22. I’ll keep you updated as more news becomes available. Here is a first teaser for season 2 of Mr Mercedes. 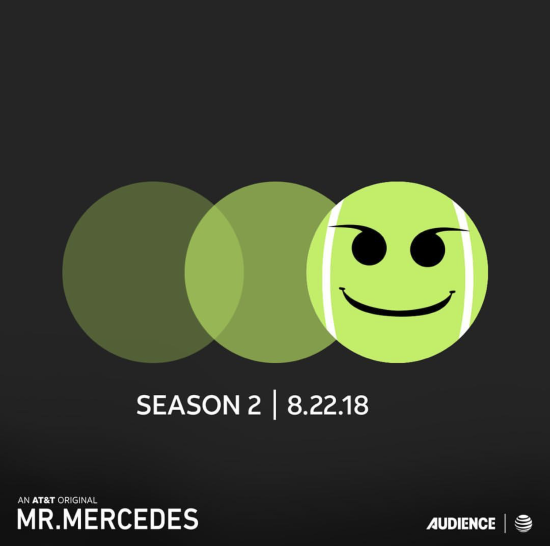 Season 2 of Mr Mercedes will premier August 22nd. 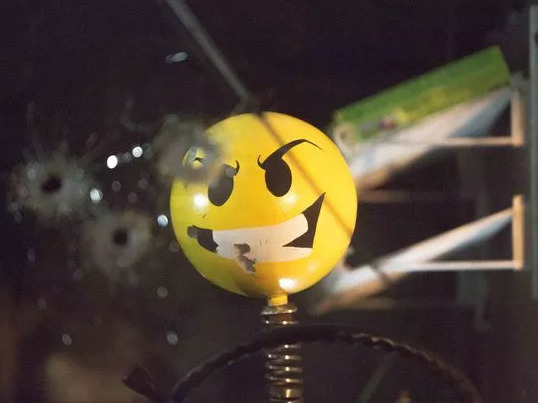 Here are three photos from the set of Mr Mercedes. Virginia Kull has been cast in Mr Mercedes. Virginia Kull is set for a recurring role in Season 2 of AT&T Audience Network’s breakout series Mr. Mercedes. 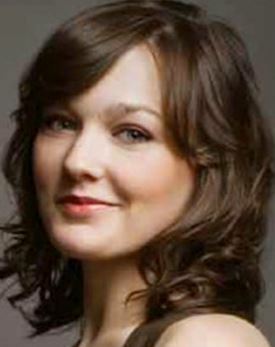 Kull will play Sadie McDonald, a nurse on the neurology ward— known as the “Brain Bucket” — at Mercy General Hospital. 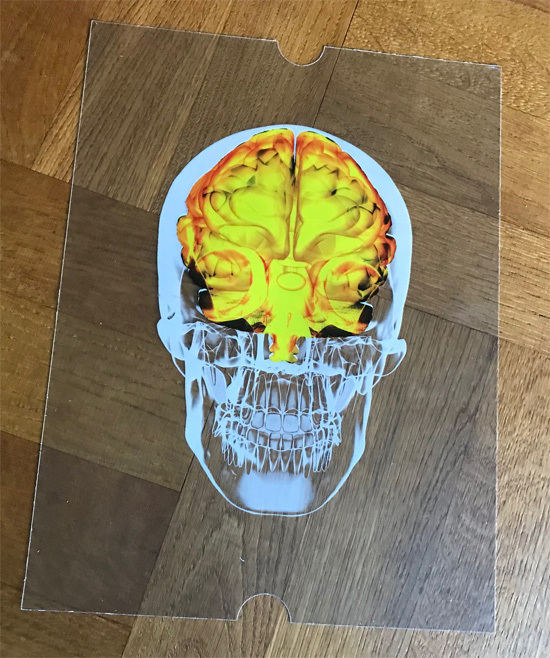 An epileptic who has recently gone off her medication, she’s prone to occasional microscopic seizures which pull her away from the task at hand. Her most famous patient is Brady Hartsfield, the infamous Mercedes killer. 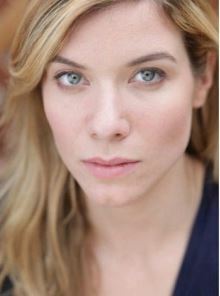 Deadline reports that Tessa Ferrer has been cast as a series regular for season 2 of Mr Mercedes. 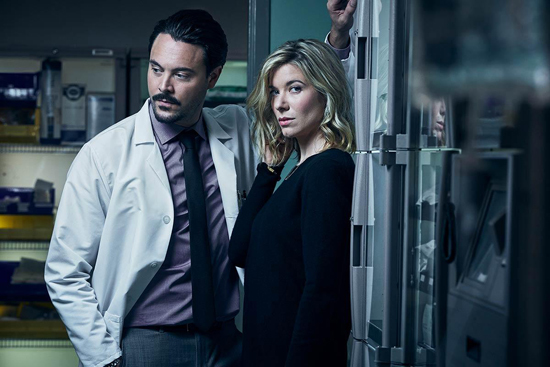 Grey’s Anatomy alumna Tessa Ferrer is set as a series regular opposite Jack Huston in Season 2 of AT&T Audience Network’s breakout series Mr. Mercedes. Production begins next month in Charleston, SC, on the Sonar Entertainment-produced Stephen King adaptation. Ferrer will play Cora Babineau, wife of Dr. Felix Babineau (Huston) and head of marketing at a major pharmaceutical corporation, who’s even more ambitious than she is beautiful. If her husband has a genius for manipulating people from the inside out as he reaches into their brains and rewires them, Cora has a genius for influencing people from the outside in. Her beauty, brains and force of will, judiciously softened with poise and extreme charm, make her a formidable saleswoman, of whatever she’s peddling. Next week production on the second season of Mr. Mercedes will commence in February in Charleston, South Carolina. 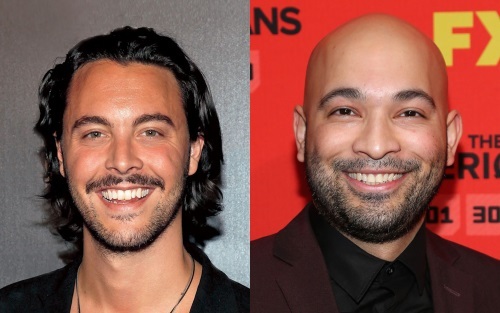 In the new 10 hour long episodes season we’ll see two new castmembers: Boardwalk Empire‘s Jack Huston and Sicario‘s Maximillian Hernandez. Huston has been cast as Brady’s doctor, Dr. Felix Babineau and Hernandez will take the role of Assistant DA Antonio Montez. Season 2 premieres on DIRECTV sometime this summer. 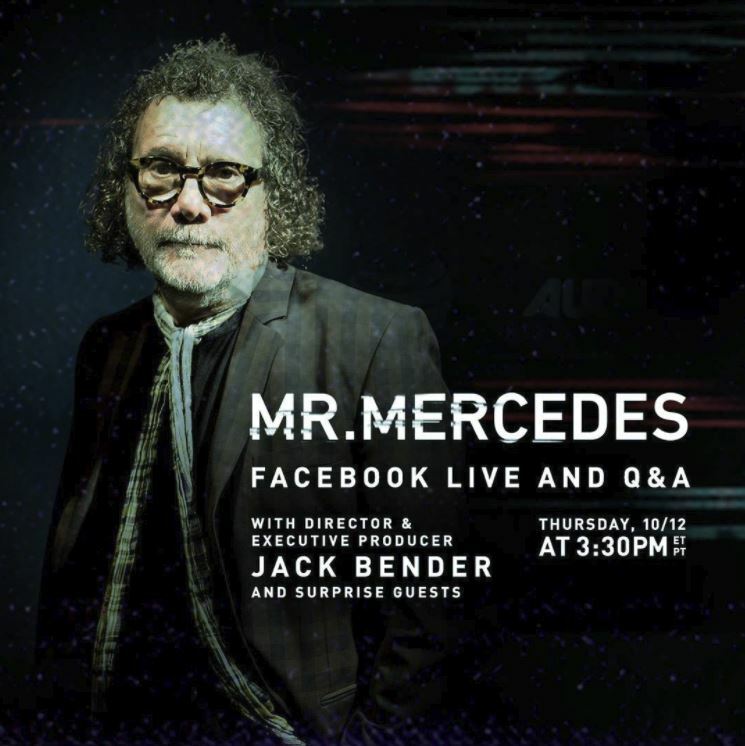 Director & producer of Mr Mercedes Jack Bender and surprise guests will do a Facebook live and Q&A at 3:30PM. 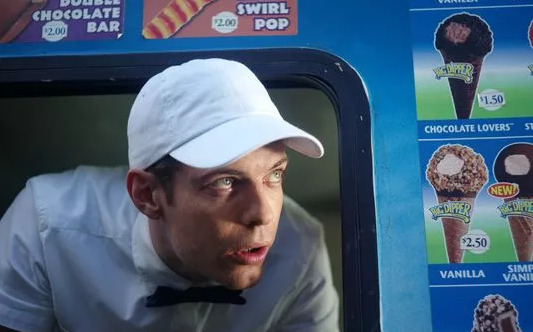 Here are my recap/thoughts on episode 10 of Mr Mercedes. Please let me know what you think. Don't miss tonight's season 1 finale! 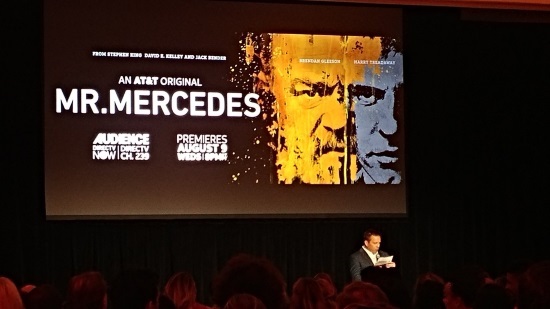 AT&T's Audience Network announced today that there will be a second season of Mr Mercedes. Filming will begin in Febrary 2018 and have it's premiere launching later in the year. Press Release: EL SEGUNDO, Calif., Oct. 10, 2017 – Leading up to the highly anticipated season finale tomorrow, Oct. 11 at 8pm ET/PT, AUDIENCE Network is pleased to announce that it has picked up this year’s break out show, “Mr. Mercedes,” for a second season. Production for the 10 one-hour episodes is scheduled to begin in February of 2018 in Charleston, South Carolina with the premiere launching later in the year. The series is produced by Sonar Entertainment. Season 1 of “Mr. 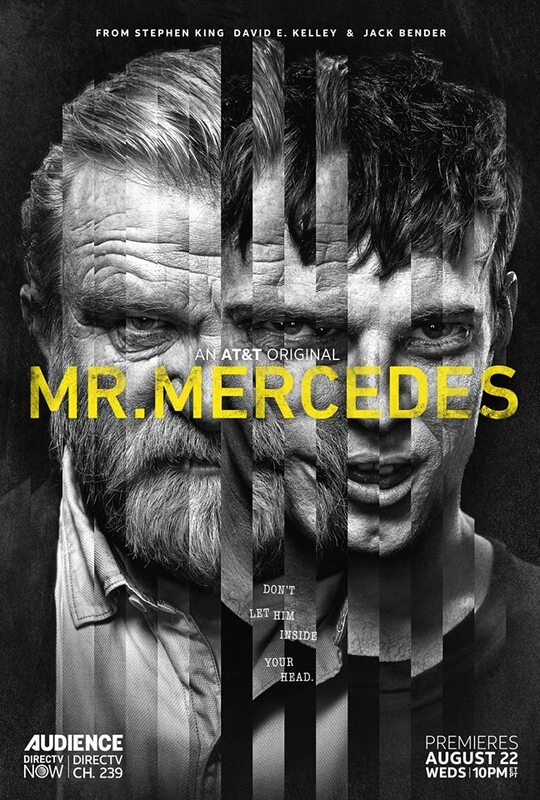 Mercedes” followed a demented killer Brady Hartsfield (Harry Treadaway) who taunts a retired police detective Bill Hodges (Brendan Gleeson) with a series of lurid letters and emails, forcing the ex-cop to undertake a private, and potentially felonious, crusade to bring the killer to justice before he is able to strike again. 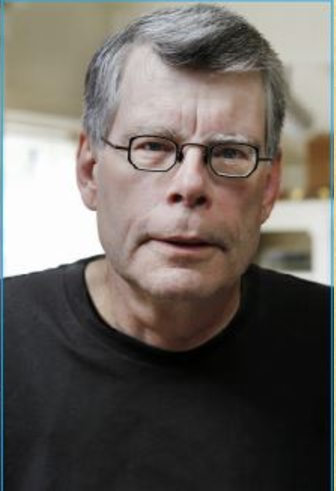 Stephen King describes “Mr. Mercedes” as his first hard-boiled detective tale. The novel was published by Scribner in June 2014 and became an immediate No. 1 New York Times Bestseller upon its release. 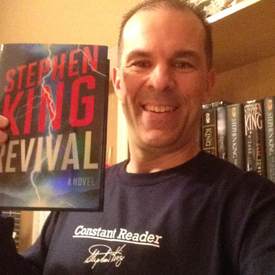 Shortly after the release of the novel, King announced that “Mr. Mercedes” was the first of a projected trilogy. The second novel, “Finders Keepers,” was published by Scribner in June 2015, and the third novel, “End of Watch,” was published by Scribner in June 2016. “Mr. Mercedes” season 1 episodes are available OnDemand on DIRECTV and U-verse platforms to DirecTV and U-verse customers. AT&T AUDIENCE Network is available on DIRECTV Ch. 239 or U-verse TV Ch. 1114 and via live streaming on the DIRECTV and U-verse apps and DIRECTV NOW. Here are my recap/thoughts on episode 9 of Mr Mercedes. Please let me know what you think. Here are my recap/thoughts on episode 8 of Mr Mercedes. Please let me know what you think. Here are my recap/thoughts on episode 7 of Mr Mercedes. Please let me know what you think. Here are my recap/thoughts on episode 6 of Mr Mercedes. Please let me know what you think. This episode is just as good as the previous ones but there are two highlights that’s something extra to be found here. 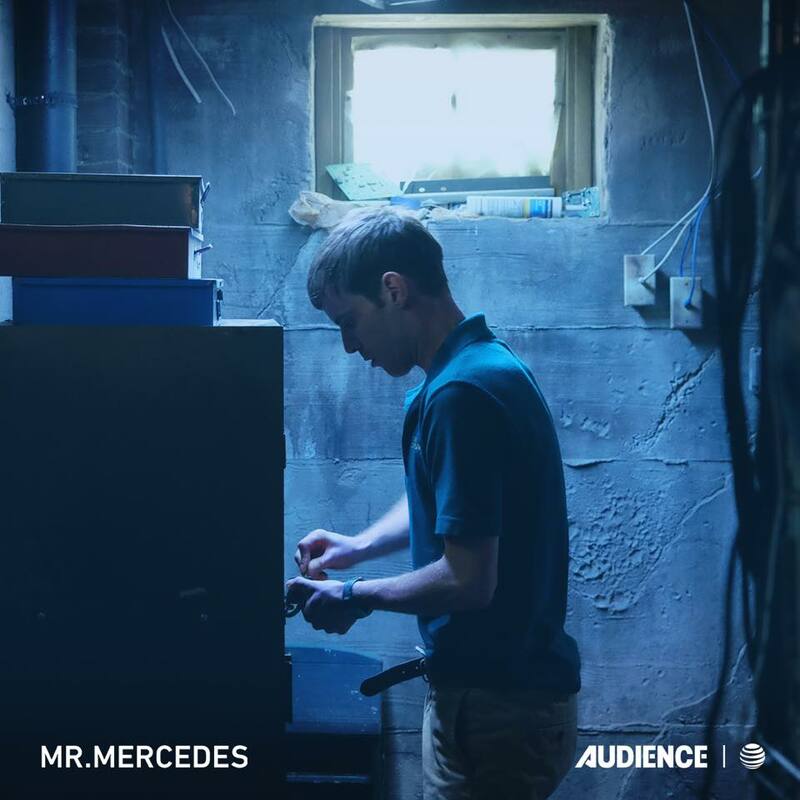 Here is the soundtrack for Mr Mercedes. Here are my recap/thoughts on episode 5 of Mr Mercedes. Please let me know what you think. As usual it’s a joy to see Kelly Lynch as Brady’s mother. She’s so perfect for this role. 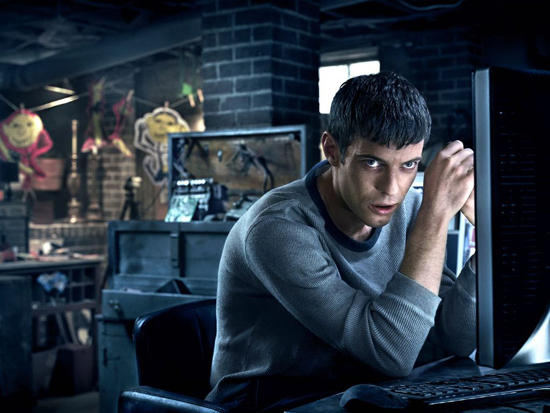 Check out the trailer for episode 5 of Mr Mercedes. Airs this Wednesday. Here are my recap/thoughts on episode 4 of Mr Mercedes. Please let me know what you think. The casting is perfect and they are all doing a fantastic job. How did you like episode 3 of Mr Mercedes? Here is a trailer for episode 4. Here are my recap/thoughts on episode 3 of Mr Mercedes. Please let me know what you think. After three episodes Brady Hartsfield might be one of the move creepy villains King has created. In case you have missed it. 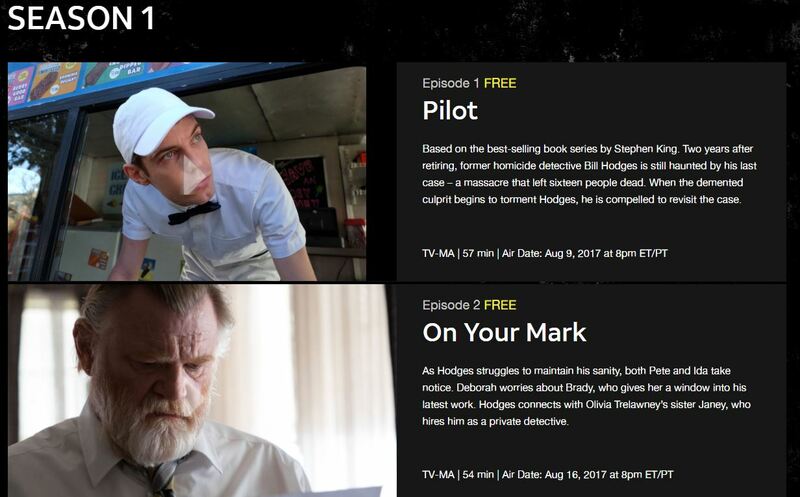 You can see the first two episodes on Mr Mercedes for free online over at Audience website. And here is a trailer for next episode; Cloudy, With a Chance of Mayhem. Here is an interview with Jack Bender about a second season and his thoughts on the show. Here are my recap/thoughts on episode 2 of Mr Mercedes. Please let me know what you think. 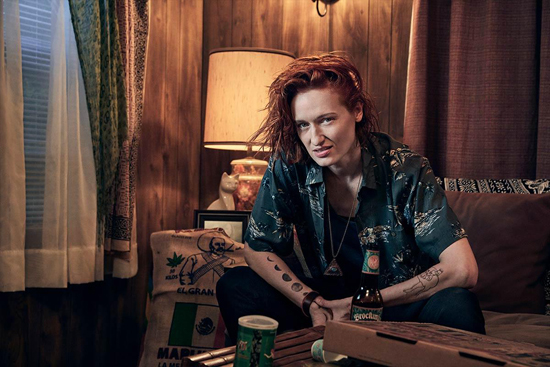 I must say, Kelly Lynch is perfect as Deborah. Creepy but that is perfect for the part. 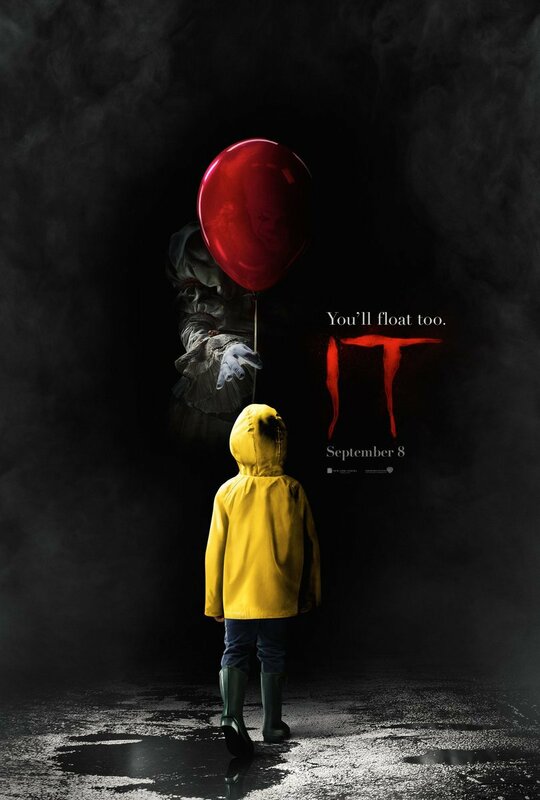 Based on the novel by Stephen King. Two years after retiring, former homicide detective Bill Hodges is still haunted by his last case. When the demented culprit begins to torment Hodges, he embarks on a crusade to bring the killer to justice. As Hodges struggles to maintain his sanity, both Pete and Ida take notice. Deborah worries about Brady, who gives her a window into his latest work. Hodges connects with Olivia Trelawney's sister Janey, who hires him as a private detective. Hodges and Janey dig deeper into the circumstances surrounding Olivia's death. Hodges uses Debbie's Blue Umbrella to turns the tables on Brady. Jerome's father intervenes in his relationship with Hodges. Ida is hurt as Hodges and Janey's relationship intensifies. Lou is disturbed by an interaction with a customer. Deborah takes Brady to the cemetery and the two reflect on their difficult past. The cat and mouse game between Hodges and Brady escalates. Hodges has an upsetting conversation with Janey's mother. Deborah's drinking almost causes an accident at the Hartsfield home. Hodges struggles with the past as it concerns his daughter, Allie. As Deb attempts to make a change for the better, Brady interferes. Robi continues pressuring Brady to impress their bosses. Hodges connects with Janey's niece, Holly. As Hodges helps Janey through a difficult time, their connection deepens. Realizing he still needs their help, Hodges brings Jerome and Holly back into the investigation. Deborah confronts Brady with her concerns. A critical error puts Brady in the center of a crisis of his own making. Holly and Jerome make a pivotal discovery. 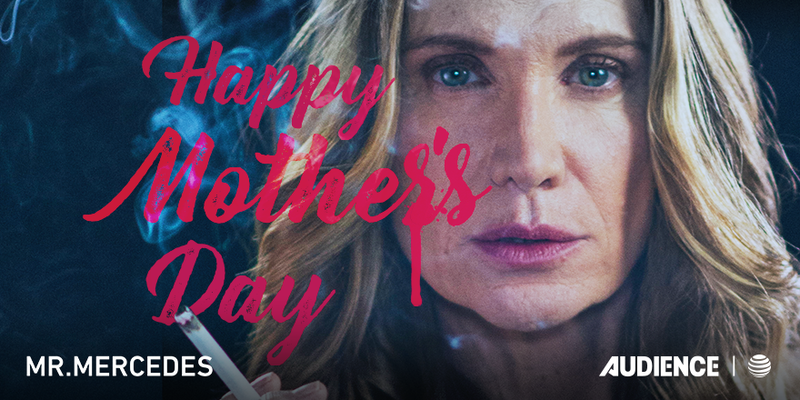 After a tragedy sends Hodges reeling, he goes to visit his daughter, Allie. When another murder victim is discovered, suspicions about Brady are confirmed. 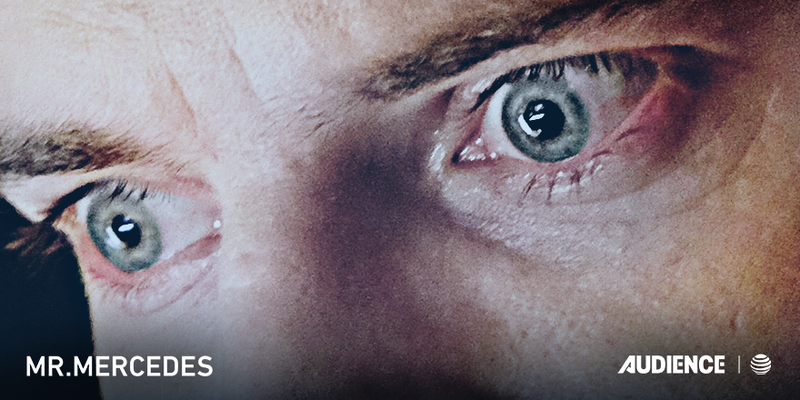 As the police prepare for another massacre, Hodges fears for the safety of those he loves. 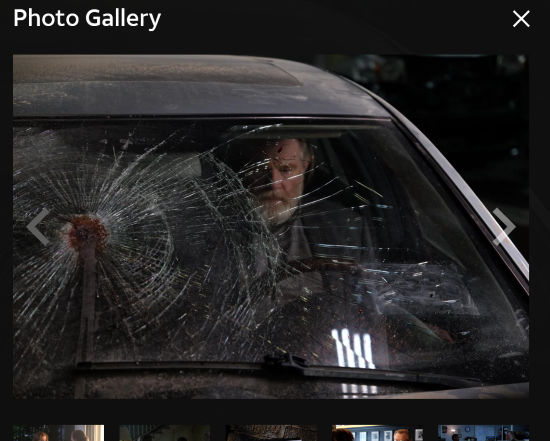 Mr Mercedes has premiered and here are some articles about it. Here are my recap/thoughts on the pilot of Mr Mercedes. Please let me know what you think. The first 8 minutes are extremely powerful and I think the series creators have done a fantastic job! Celebrity Page TV Network reports about Mr Merdedes. 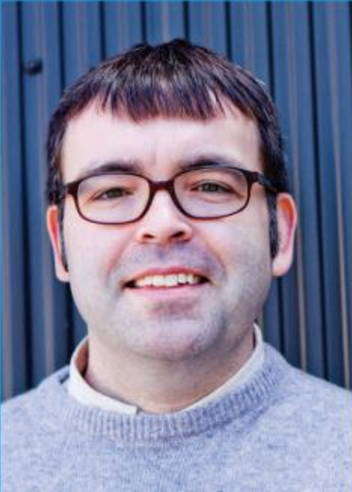 Owen King who co-wrote Slepping Beauties with Stephen writes about Mr Mercedes in this article: Owen King looks back on one of his father’s most unconventional novels, Mr. Mercedes. 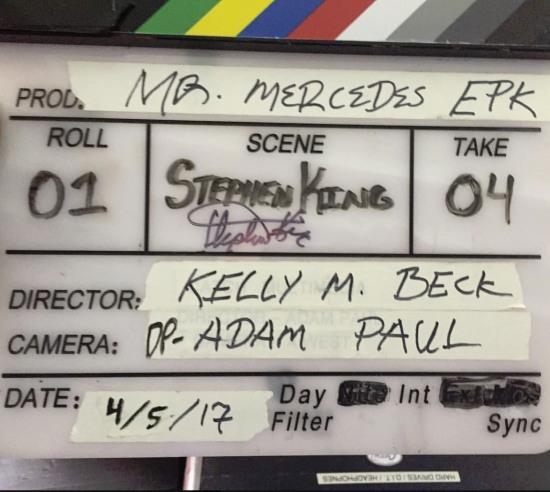 Here are three new "Behind the scenes" from Mr Mercedes. 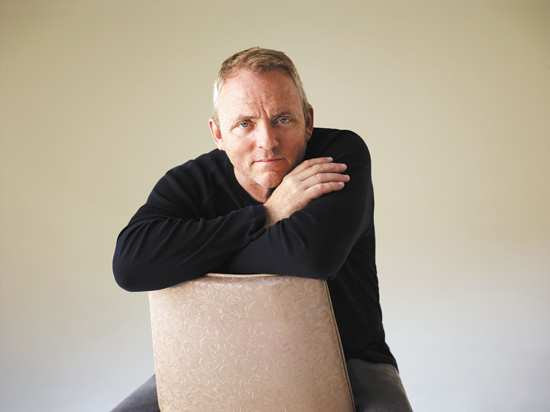 Here is an interview I did with Dennis Lehane who wrote four episodes of Mr Mercedes. Stephen gave us such great source material that we didn’t range too far from it. We tended to drill down on things because we had the space. But we didn’t deviate too far from the foundational text. 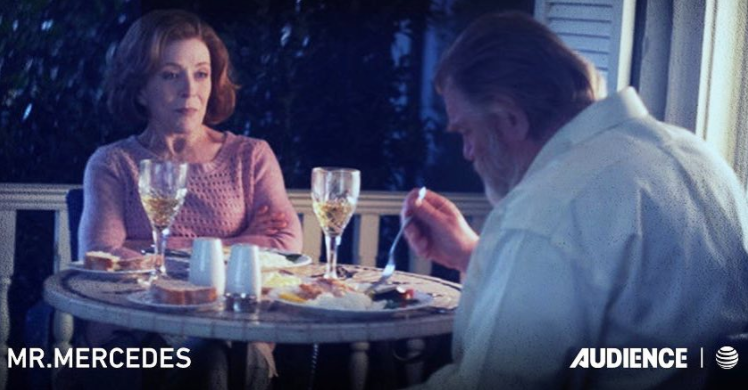 Here is a clip from Mr Mercedes at the SAG-AFTRA Foundation. And here are some new photos of the cast. Here is a behind the scenes clip from Mr Mercedes where King talks about the show. Here's the entire Mr Mercedes panel from Comic Con. 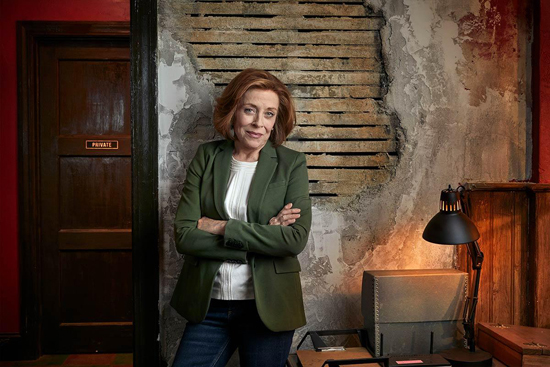 Here are some clips with Holland Taylor talking about his character (Ida) in Mr Mercedes. 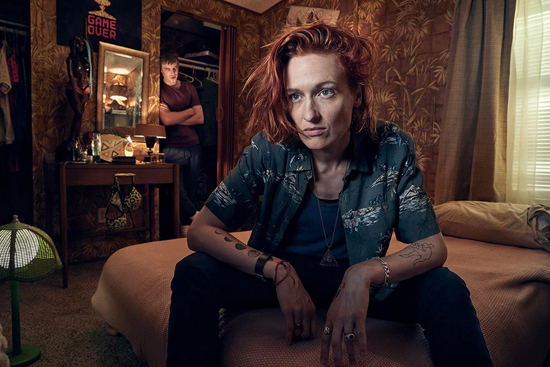 Here are some clips with Breeda Wool talking about his character (Lou) in Mr Mercedes. Here are some clips with Kelly Lynch talking about his character (Brady's Mother) in Mr Mercedes. 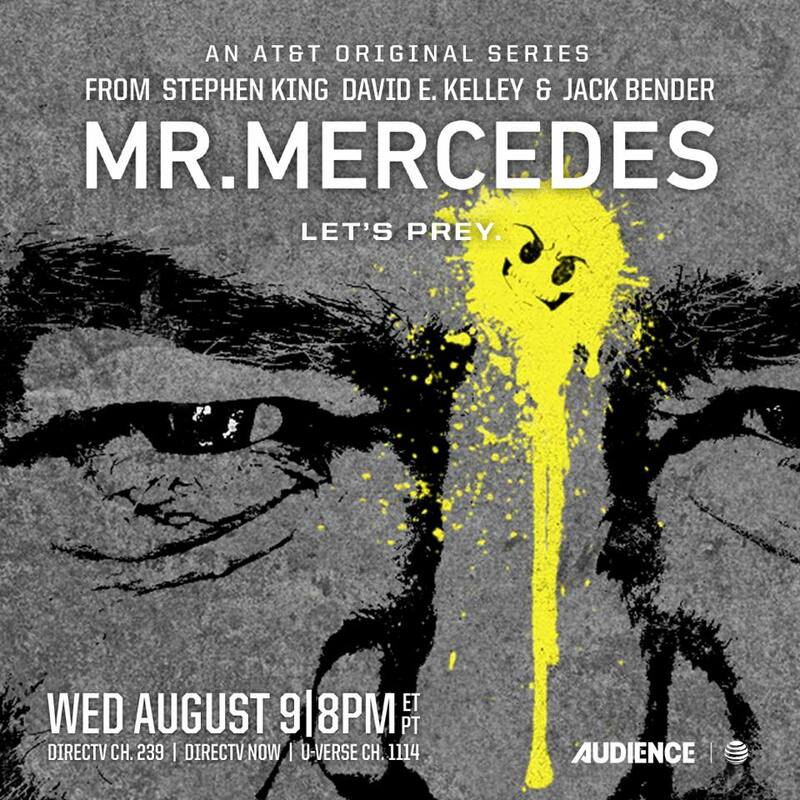 Executive producer Jack Bender talks about Mr Mercedes. Here are some interviews with the cast of Mr Mercedes. 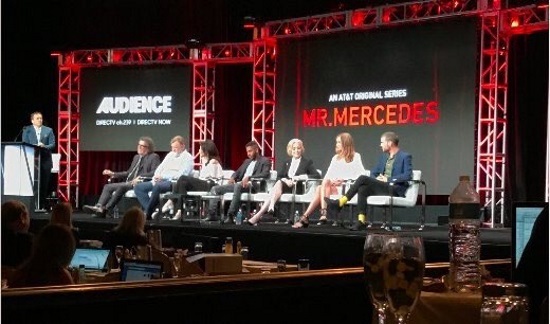 At Tuesday’s Television Critics Association press tour panel for Mr Mercedes we got some new info about the series. Jack Bender, Brendan Gleeson, Mary Louise Parker, Jahrrel Jerome, Holland Taylor, Kely Lynch and Harry Treadaway. …King had said he wishes he’d written some of the changes they made. 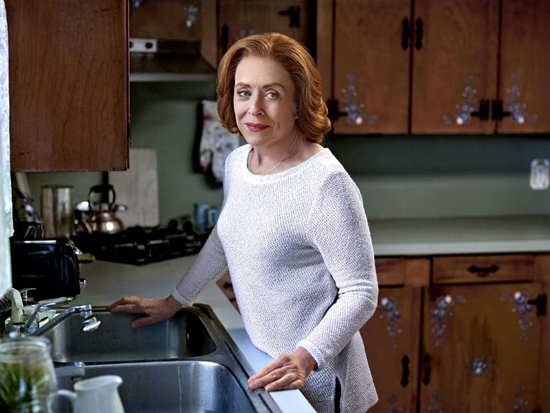 …Holland Taylor’s Character Ida wasn’t in the book but is there to humanize Bill. 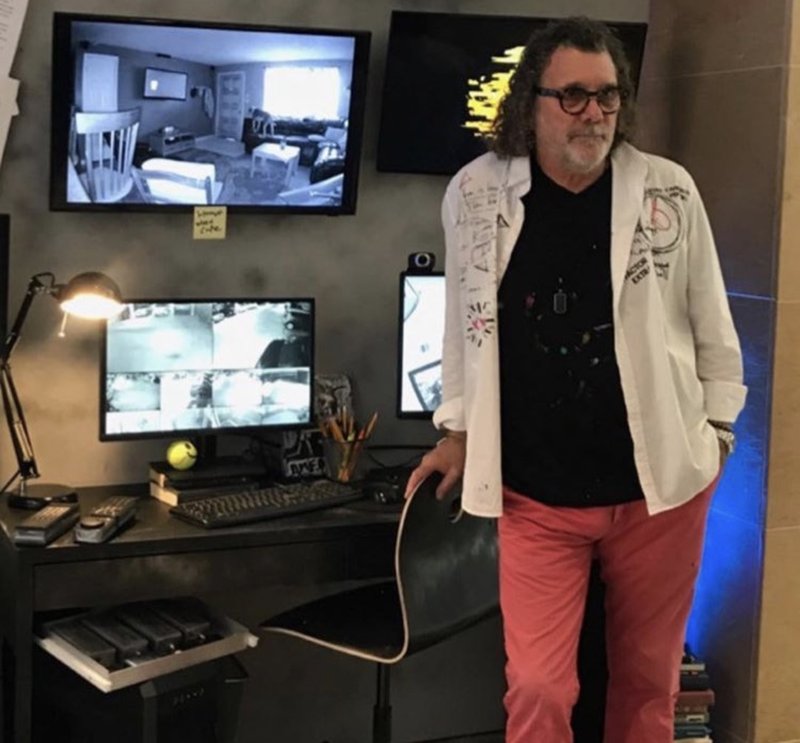 The Geek Speak Show's Henry San Miguel talks to Executive Producer/Director of Mr. Mercedes, Jack Bender. Executive producer Jack Bender talks about the possiblity of a season 2 and 3 of Mr Mercedes. 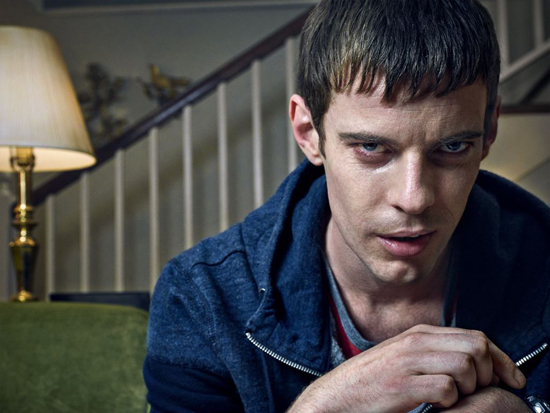 Here are some clips with Harry Treadaway talking about his character (Brady) in Mr Mercedes. Did you read all three books? 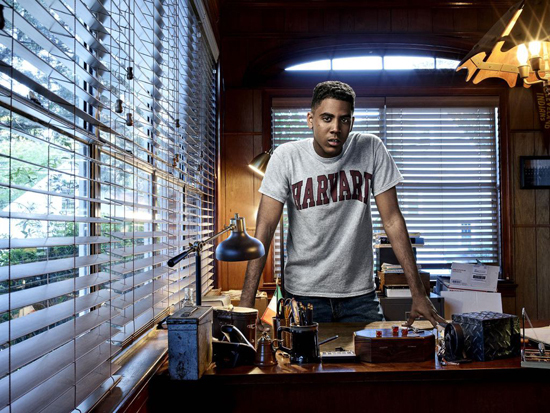 Here are some clips with Jharrel Jerome talking about his character (Jerome) in Mr Mercedes. What did he learn from Jack Bender? 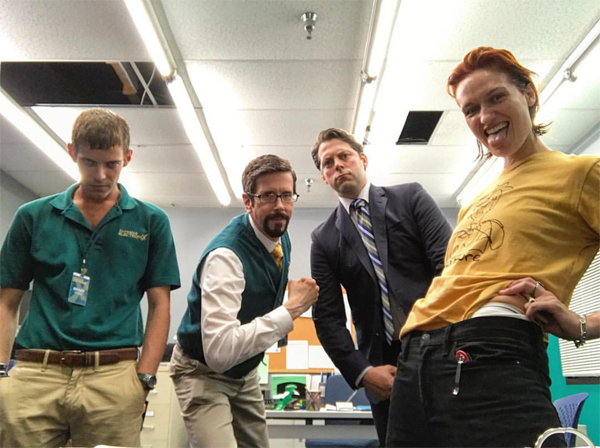 Here is an interview I just did with Hannah Bender, costume designer for Mr Mercedes. 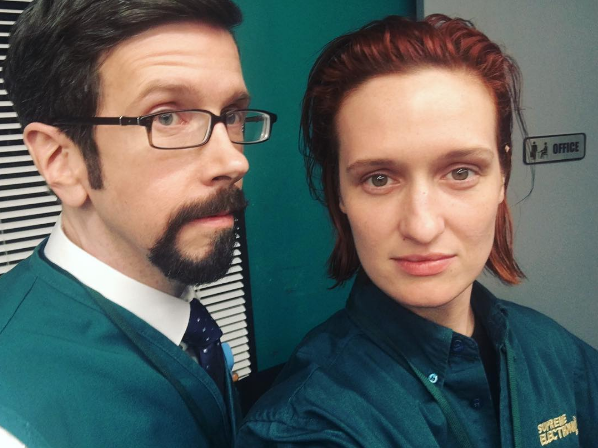 Her job is to make sure everyone clothes is as they should and I think you’ll keep a closer eye on the characters clothes after you read what she has to say… She also sent along a few really cool behind-the-scenes photos. 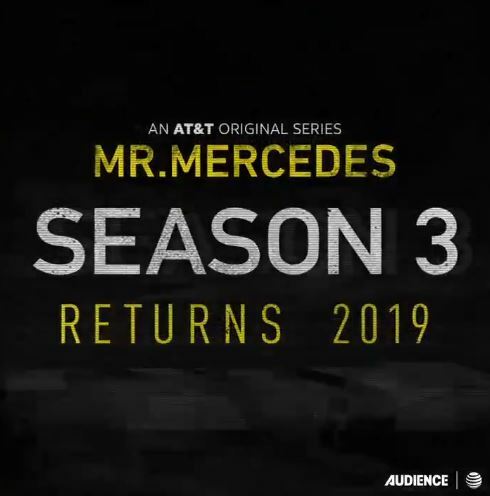 Mr Mercedes Running For 3 Seasons? 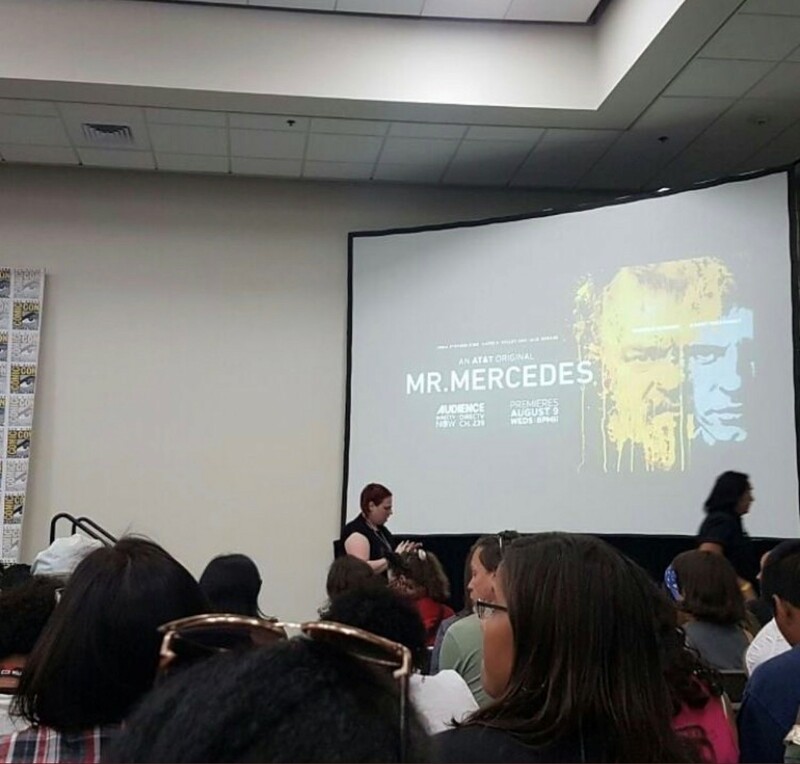 Mr Mercedes had its Comic Con panel yesterday and the Internet flooded with photos and videos from the event. Below are two clips. One where Harry Treadaway (Brady) talks about his part and one where the cast talks about the show. - Director Jack Bender said he hopes to do three seasons of Mr Mercedes. One based on each of the three book. - At the end of the panel a clip was shown that featured a bloody cameo from Stephen King. 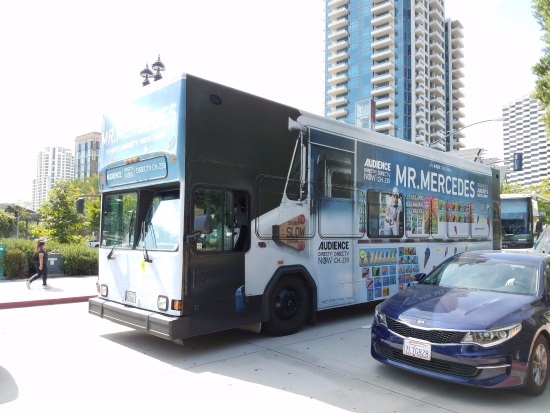 Mr Mercedes is all over Comic Con. 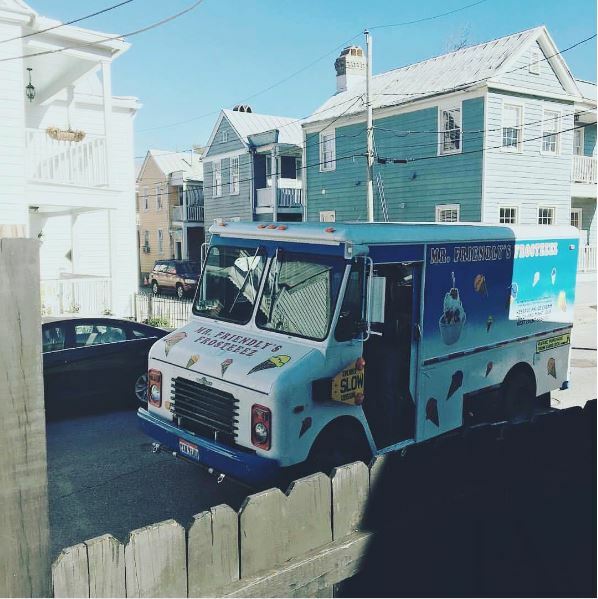 Comic Con is here and this year both Mr Mercedes and IT are present and this is what we can expect. Sunday July 23: The Mr Mercedes panel. Jack Bender (EP/director, Lost, Under the Dome), Harry Treadaway (Penny Dreadful), Kelly Lynch (The L Word), Holland Taylor (Two and a Half Men, The Practice), and Breeda Wool (UnREAL) discuss their new original series on AT&T Audience Network based on the bestselling Stephen King novel, which follows a demented killer who taunts a retired police detective and the crusade to bring the killer to justice before he is able to strike again. Do you have King related photos from Comic Con? Please send them to me and I’ll post them here. Oh, and if you find any cool King swag, pick up an extra for me, OK? Here is an interview Entertainment Weekly did with David E. Kelley about Mr Mercedes. That is a quality that Brendan Gleeson is able to bring to the table. He was everybody’s first choice. Here is a brand new teaser for Mr Mercedes called Duel. 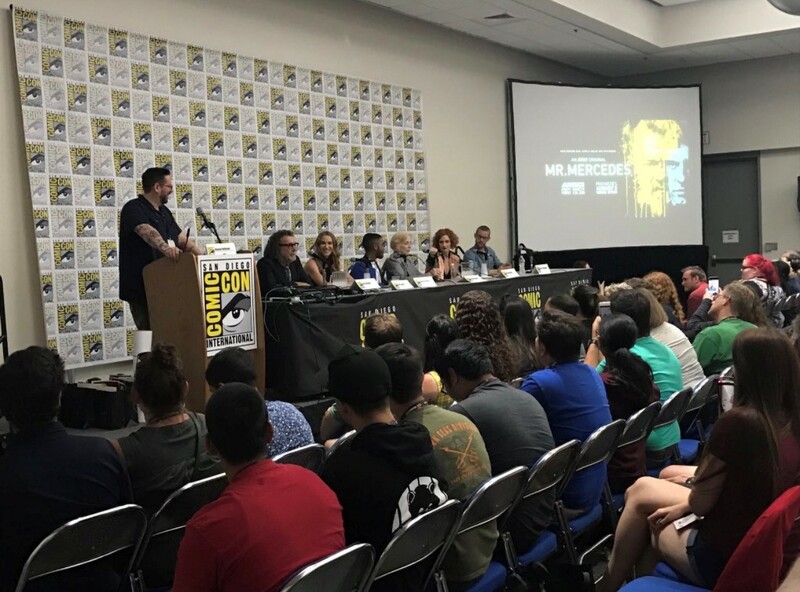 If you're at Comic Con this year, don't miss the Mr Mercedes panel on Sunday, July 23 1:30pm - 2:30pm. Jack Bender (EP/director, Lost, Under the Dome), Harry Treadaway (Penny Dreadful), Kelly Lynch (The L Word), Holland Taylor (Two and a Half Men, The Practice), Jharrel Jerome (Moonlight), and Breeda Wool (UnREAL) discuss their new original series on AT&T Audience Network based on the bestselling Stephen King novel, which follows a demented killer who taunts a retired police detective and the crusade to bring the killer to justice before he is able to strike again. Here is a new trailer for Mr Mercedes. 1 month from today we'll see the premier of Mr Mercedes. You do NOT want to miss that! Take my word for it! 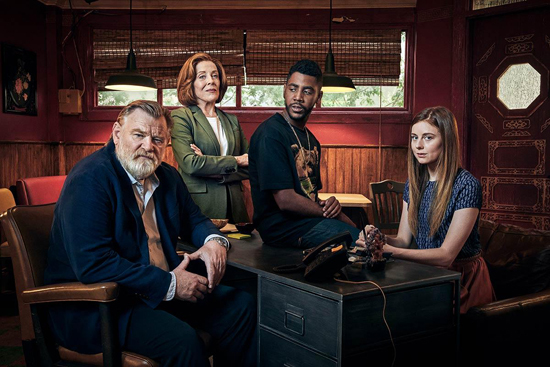 Here are some new photos of the cast from Mr Mercedes. Me Mercedes will be at Comic Con on July 23. 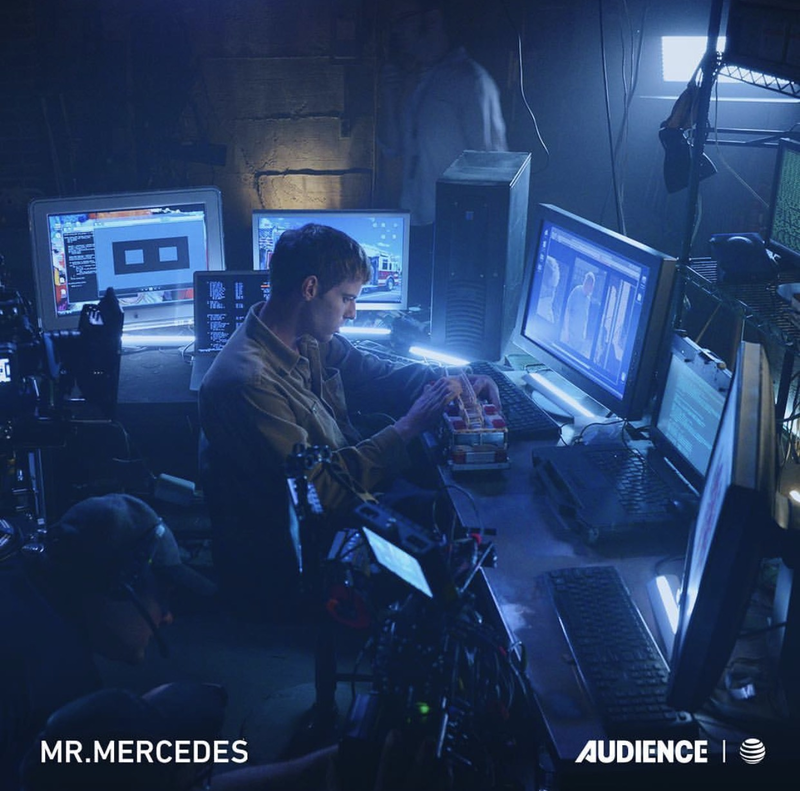 Check out an ET Exclusive video from Mr Mercedes. 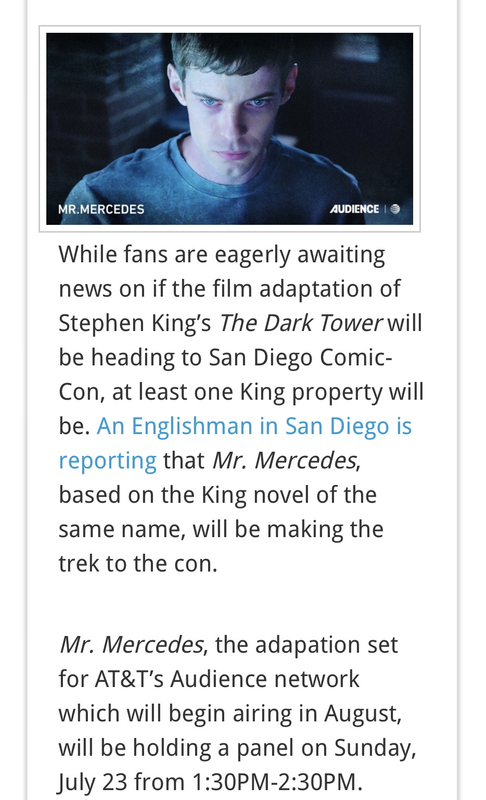 Mr Mercedes is heading to ComicCon. 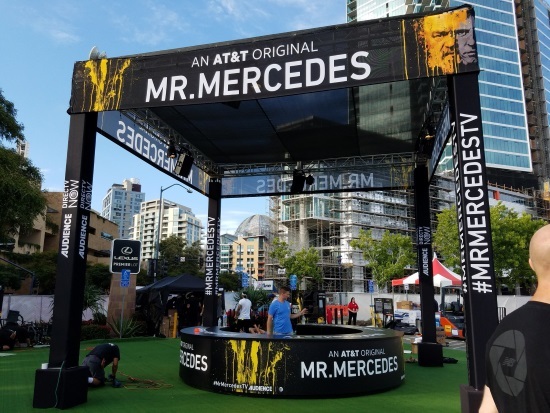 Mr. Mercedes, the adapation set for AT&T’s Audience network which will begin airing in August, will be holding a panel on Sunday, July 23 from 1:30PM-2:30PM. 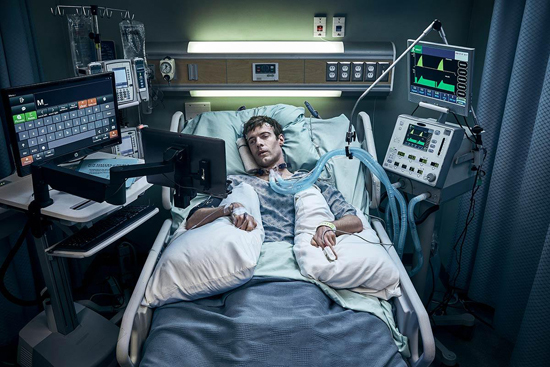 They’ll be bringing along director Jack Bender, as well as cast members Harry Tredaway, Holland Taylor, Kelly Lynch, Jharrel Jerome, and Breeda Wool to discuss the upcoming series. The series also stars Brendan Gleeson, but it doesn’t look like he will be on the panel. 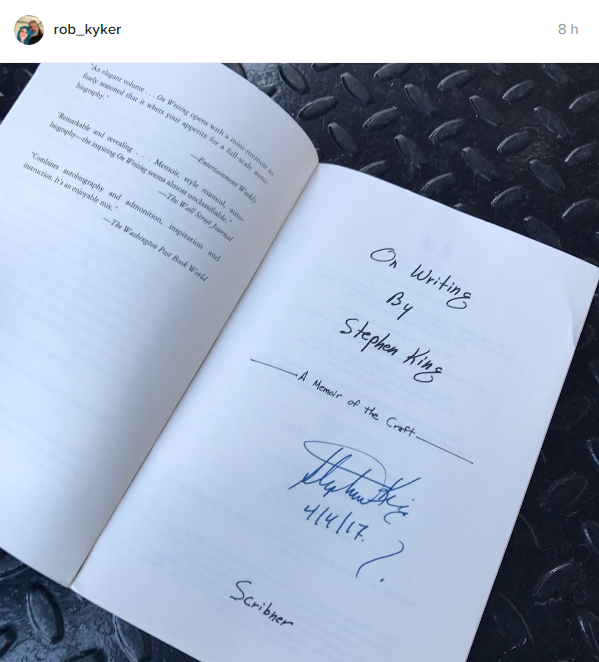 News about Stephen & Owen’s signings for Sleeping Beauties are starting to come in and here I will list news as they come in. 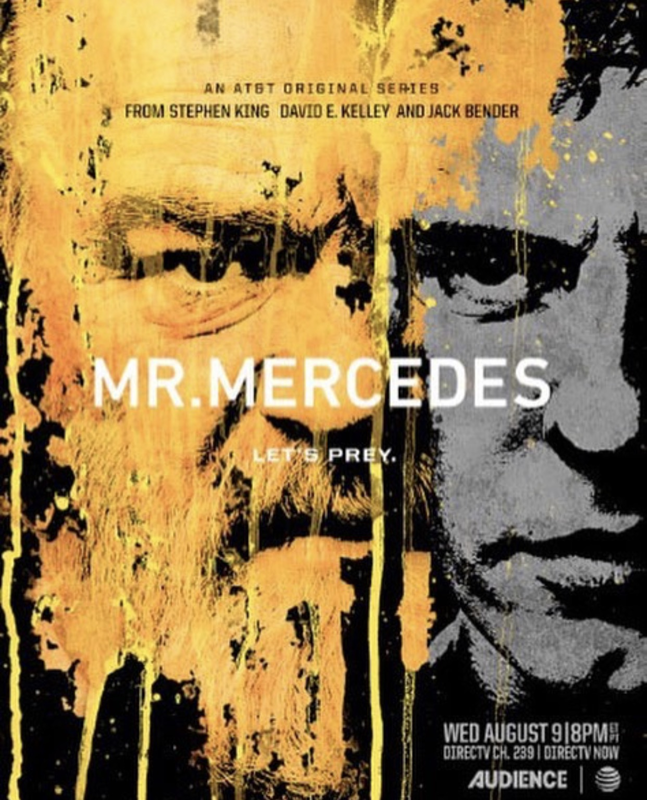 Is Mr Mercedes This Years Winner? 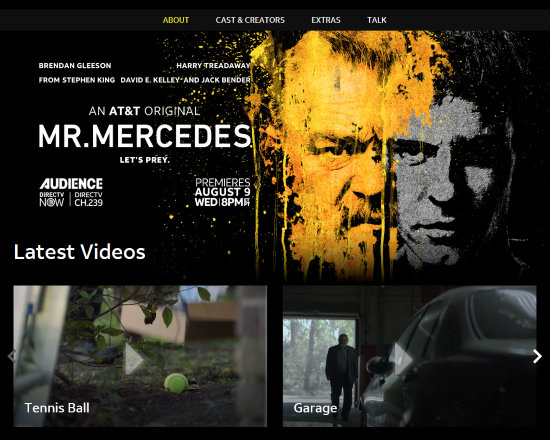 Head over to the official Mr Mercedes site. There you can find to more teasers (Garage and Teaser) that I haven’t seen elsewhere. What do you think about the laughter at the end by the way? There are also a lot of photos there, both from the series and behind the scene. I just saw the pilot of Mr Mercedes and the first 8 minutes are among the best I have seen in a long time. It's gruesome, it's cruel but it's so good! 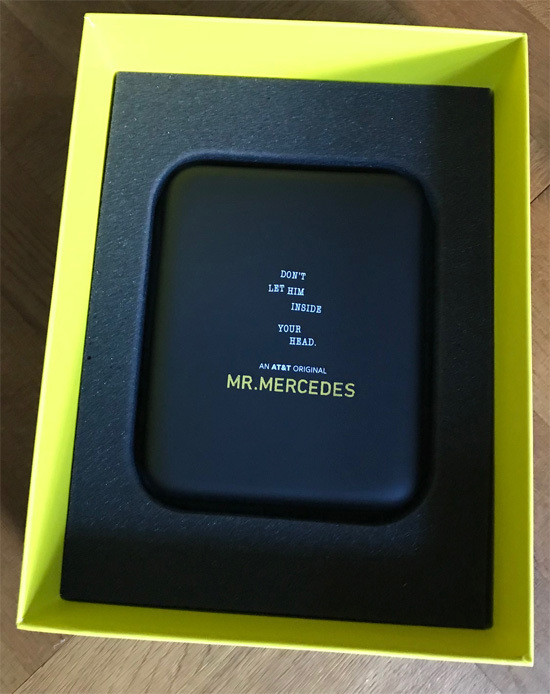 Mr Merceds now has an official site. On it you can find 2 short teasers, info about the characters and a photo gallery. Check it out here. Here is the cover for a new paperback edition of Mr Mercedes. Out July 25th. Pre-order here. 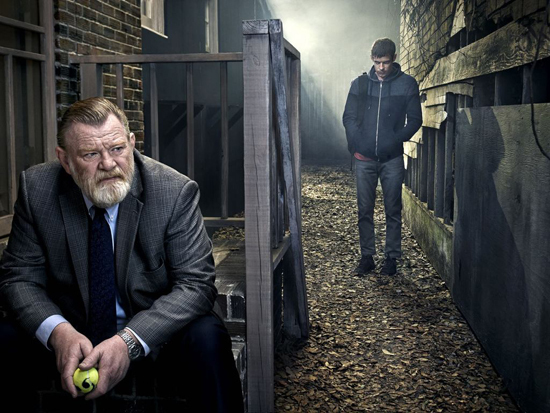 Here is a new promotional photo for Mr Mercedes. USA Today has a first preview of Mr Mercedes. Here are some photos from the Mr Mercedes. 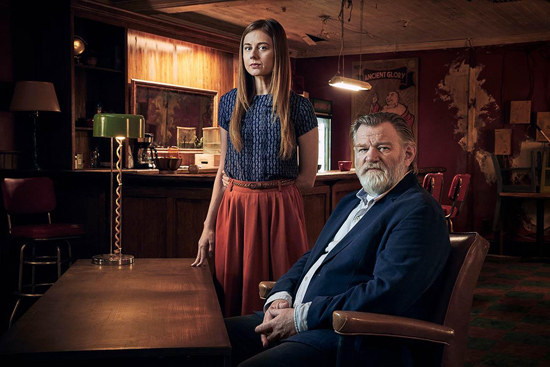 Here is a new photo from Mr Mercedes. The New York Times gives Mr Mercedes a thumbs up. 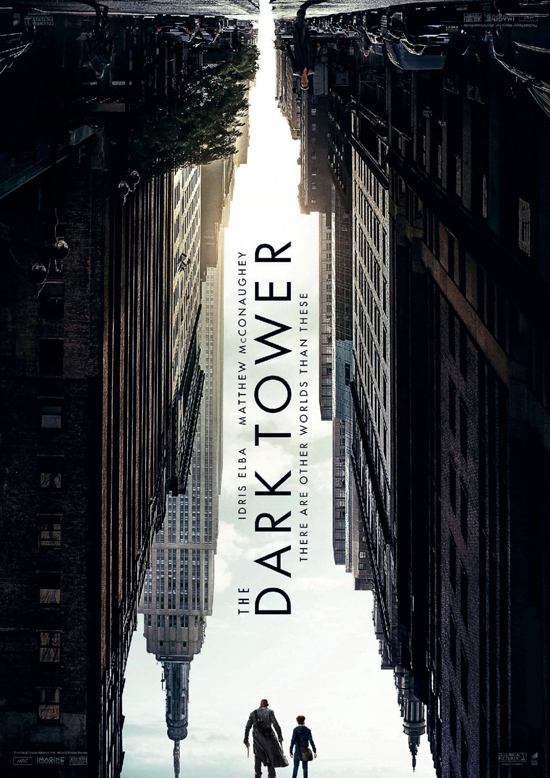 Based on its first two episodes, this dramatization of the Edgar Award-winning 2014 mystery novel of the same title is the Stephen King adaptation to watch this summer. 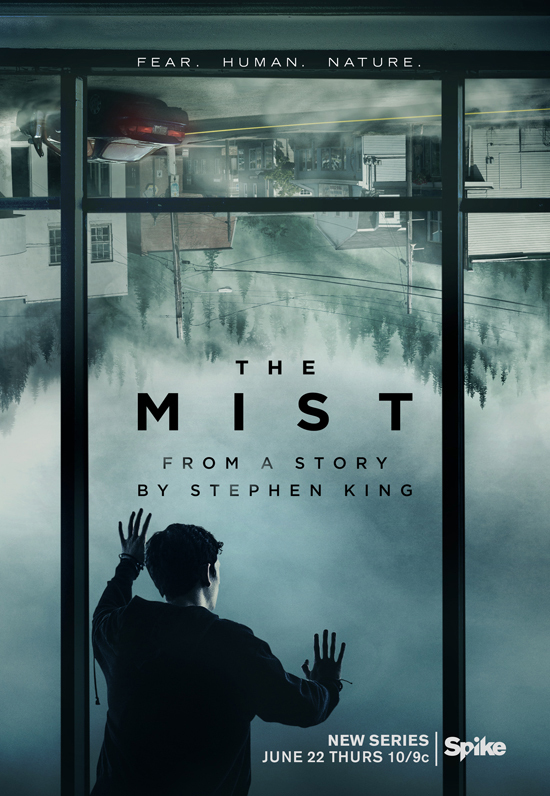 (Spike’s version of “The Mist” debuts June 22.) David E. Kelley wrote the 10-episode series about a retired detective taunted by a mass killer he couldn’t catch. 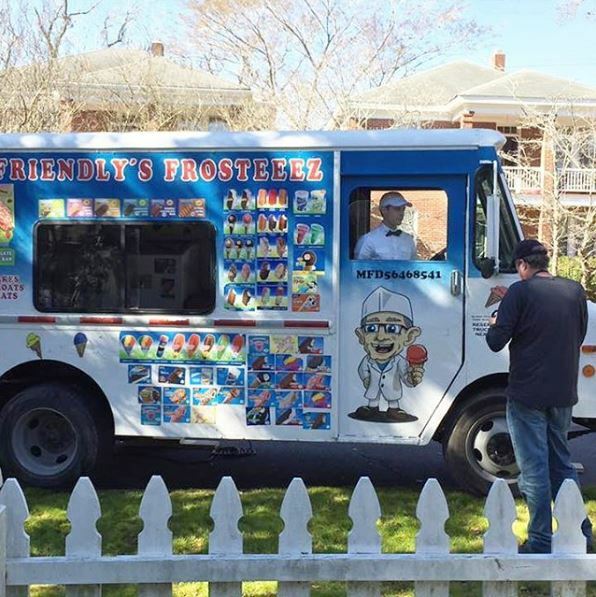 It has a bit of a “Mr. Robot” vibe and an interesting cast that includes Brendan Gleeson, Holland Taylor, Breeda Wool, Kelly Lynch and Mary-Louise Parker. Harry Treadaway of “Penny Dreadful” plays the killer, replacing Anton Yelchin, who died last year before filming began. Here are a few now photos from Mr Mercedes. 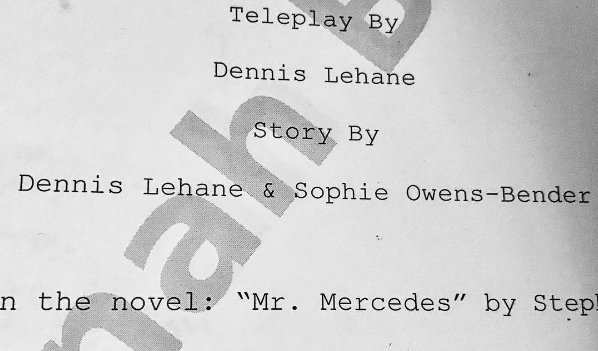 A month ago I got confirmation that Dennis Lehane, who wrote for shows like Boardwalk Empire and The Wire wrote four episodes of Mr Mercedes and today I can reveal that he wrote episode 4, 6, 7 and 10 (season finale). 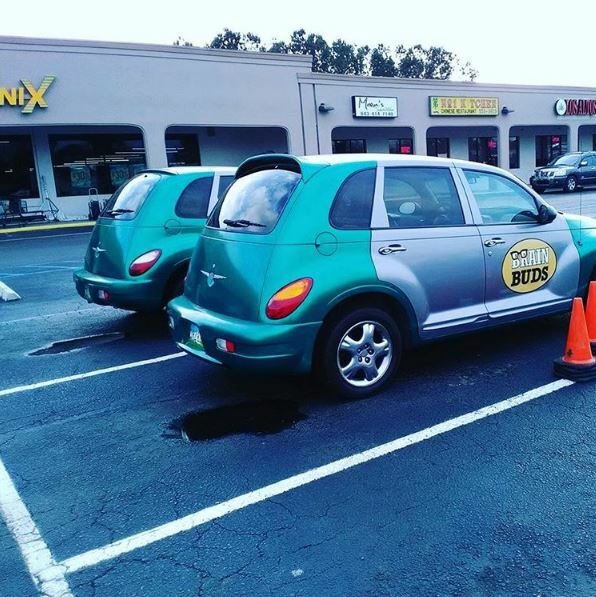 Bill Hodges is ready for the premier of Mr Mercedes, are you? 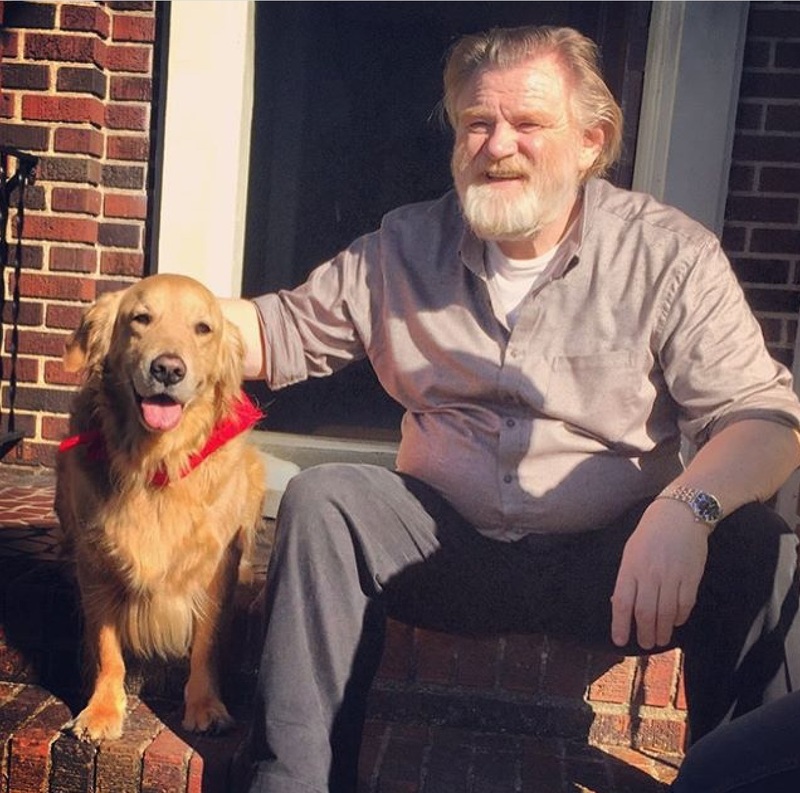 Logan Fahey and Brendan Gleeson. 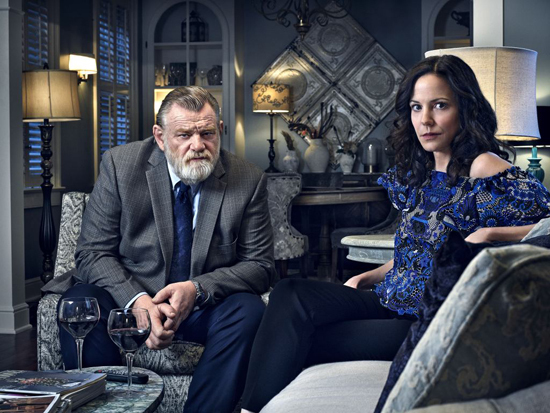 Two new photos from Mr Mercedes. Loks great if you ask me. Here are a few new photos from Mr Mercedes. In two weeks filming on Mr Mercedes will wrap and then 10 weeks after that, on August 9, we’ll see the first of 10 episodes. Mr. Mercedes is ready to roll. Audience Network has set an 8 PM Wednesday, August 9, premiere for the series. Mr. Mercedes will also will be available on DirecTV Now. 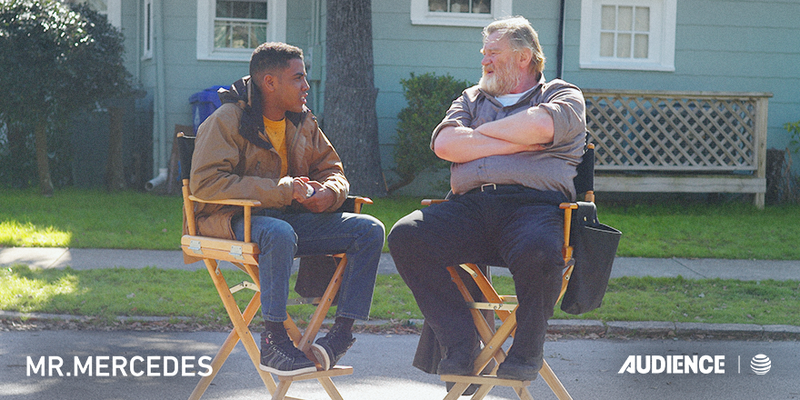 Jharrel Jerome and Brendan Gleeson who plays Jerome and Bill on the set of Mr Mercedes. 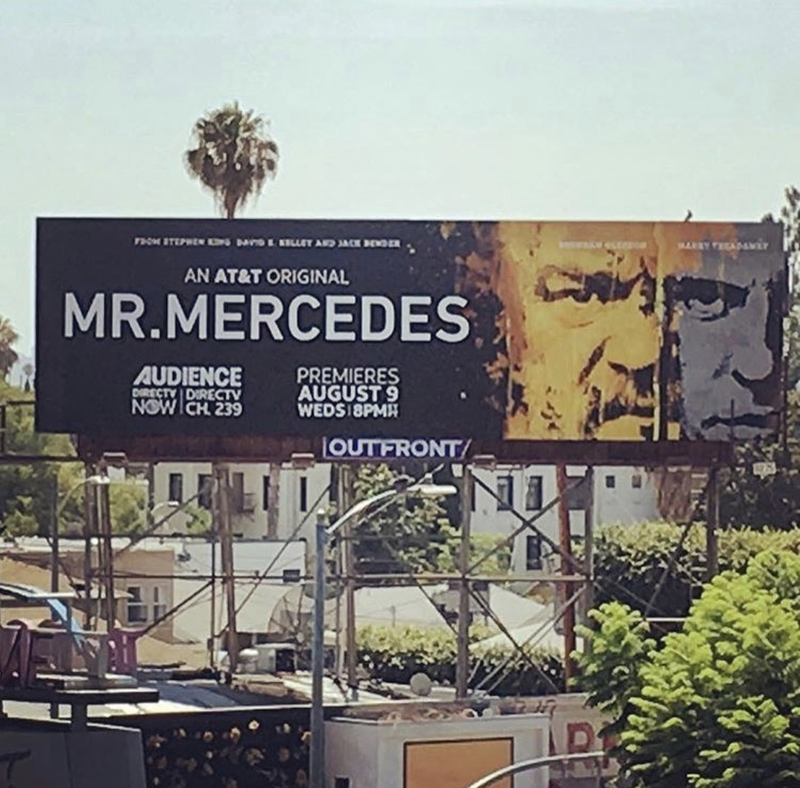 Mr Mercedes To Premier This Summer! The Mr Mercedes new has an official Facebook page and on it they say it will premier this summer! How about that! No exact date has been set but my guess is sometime during July/August. More info as soon as we get it and in the meantime, follow them on facebook. 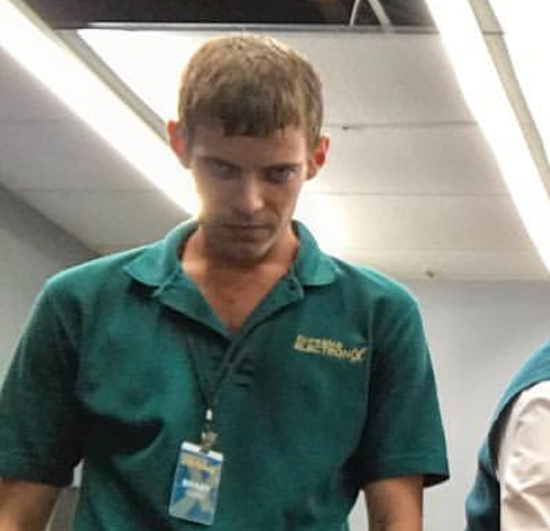 On this photo (to the left) we get a first look at Brady Hartsfield (played by Harry Treadaway) in Mr Mercedes. 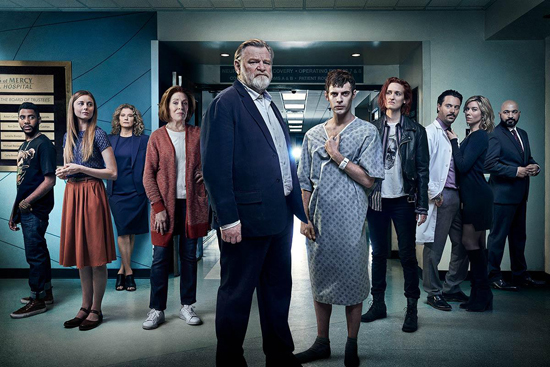 Laura Innes who played Kerry Weaver on ER is directing at least one episode of Mr Mercedes. 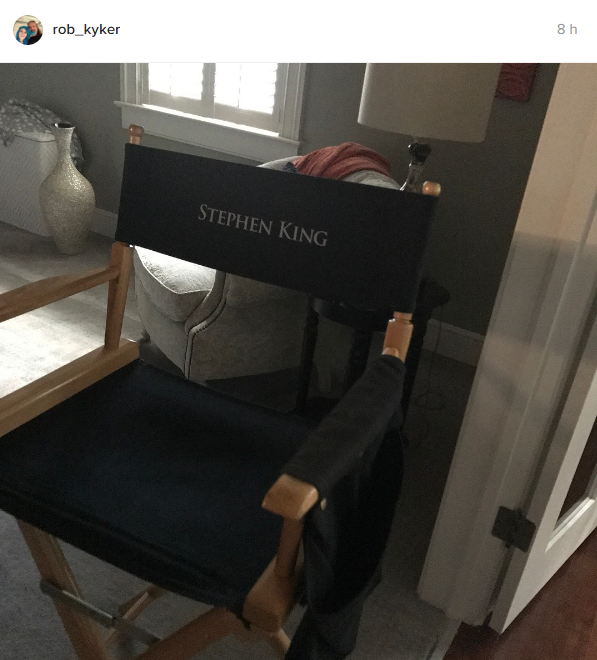 Looks like King will have a cameo in Mr Mercedes. 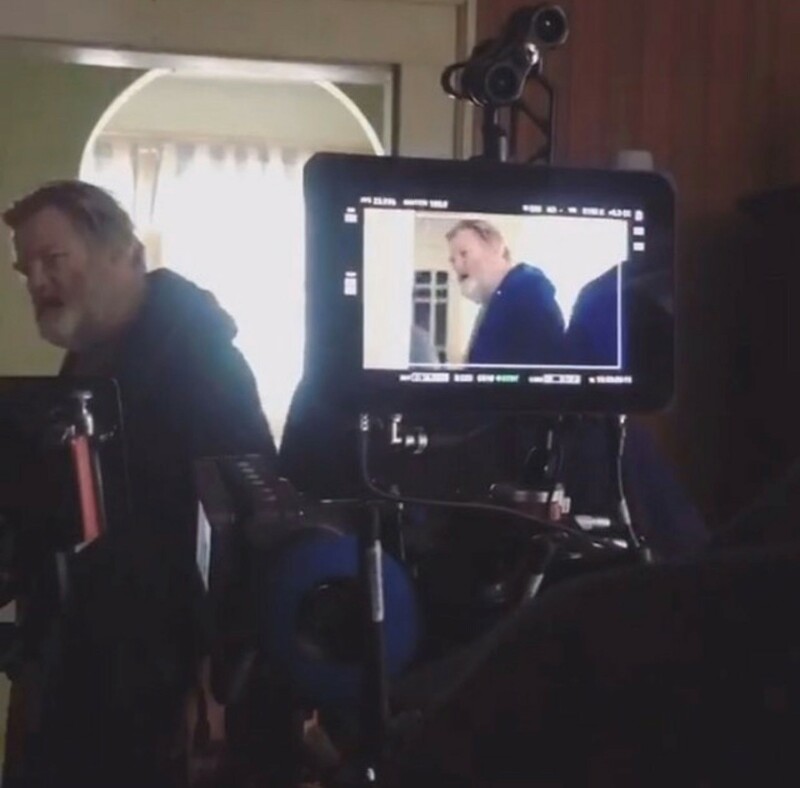 Here is a photo of Brendan Gleeson as Detective Bill Hodges filming Mr Mercedes. 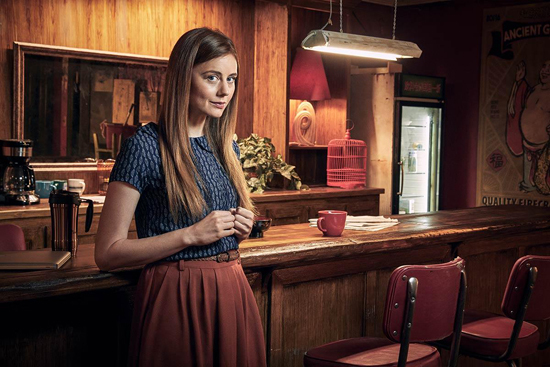 Actress Justine Lupe is now a brunette for the role of Holly in Mr Mercedes. 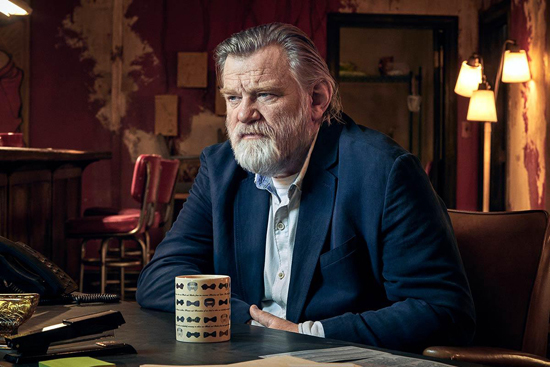 So, what do you think of Brendan Gleeson as Detective Bill Hodges in Mr Mercedes? 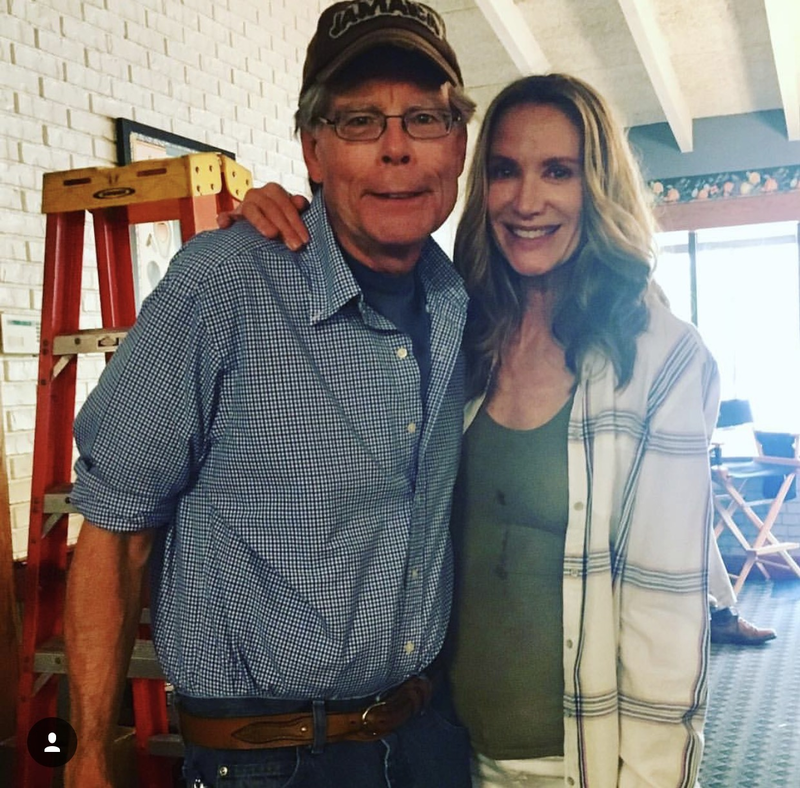 Here's King and Kelly Lynch who plays Deborah Hartsfield in Mr Mercedes. Here is a photo from Mr Mercedes. 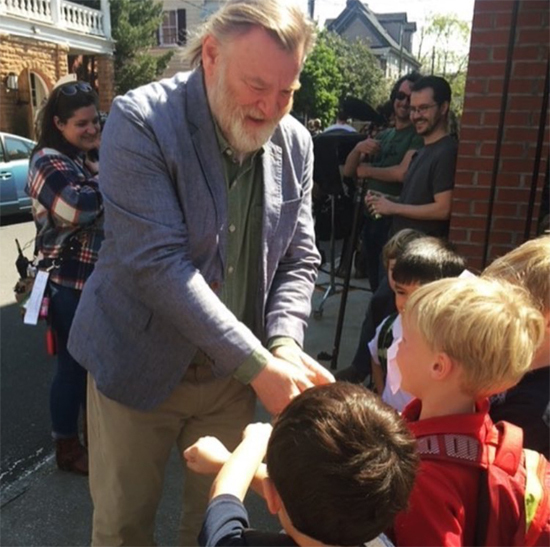 Here are two photos from when King visited the set of Mr Mercedes. 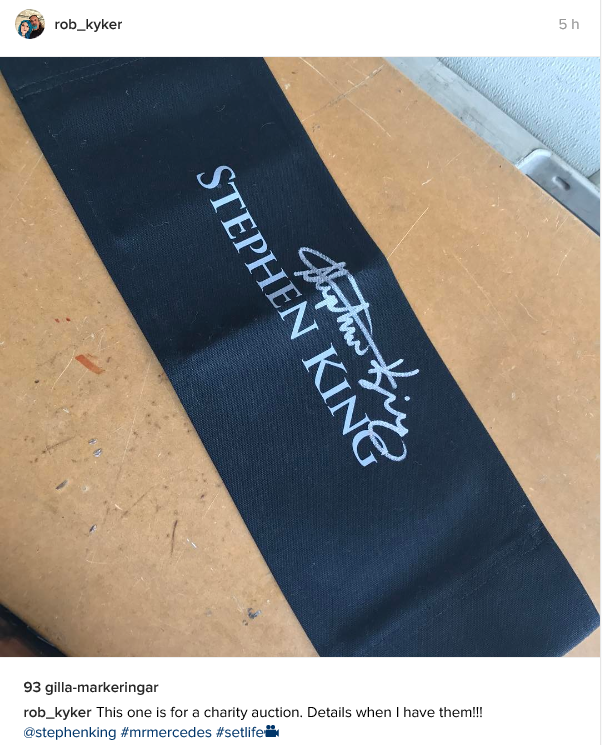 Rob Kyker who works on the set of Mr Mercedes shared these photos yesterday that indicates that King visited the set for Mr Mercedes. If that means he's doing a cameo was NOT mentioned. 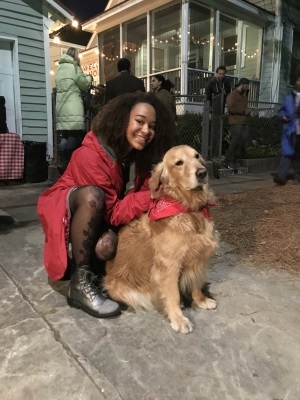 Here are a few behind the scenes photos from Mr Mercedes that I found today. The photo of the script you see if of the script for episode 6. 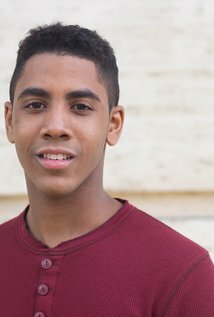 Here is a video message from Jharrel Jerome (Jerome Robinson) on the set of Mr Mercedes. 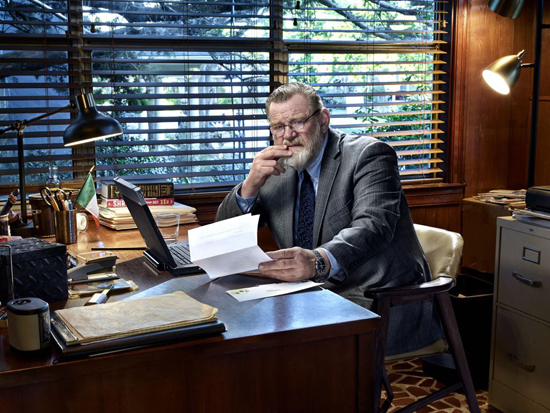 Brendan Gleeson as Detective Bill Hodges on the set of Mr Mercedes. Today I got confirmation that the premier of the Mr Mercedes TV series now is planned for the fall of this year instead of in 2018. 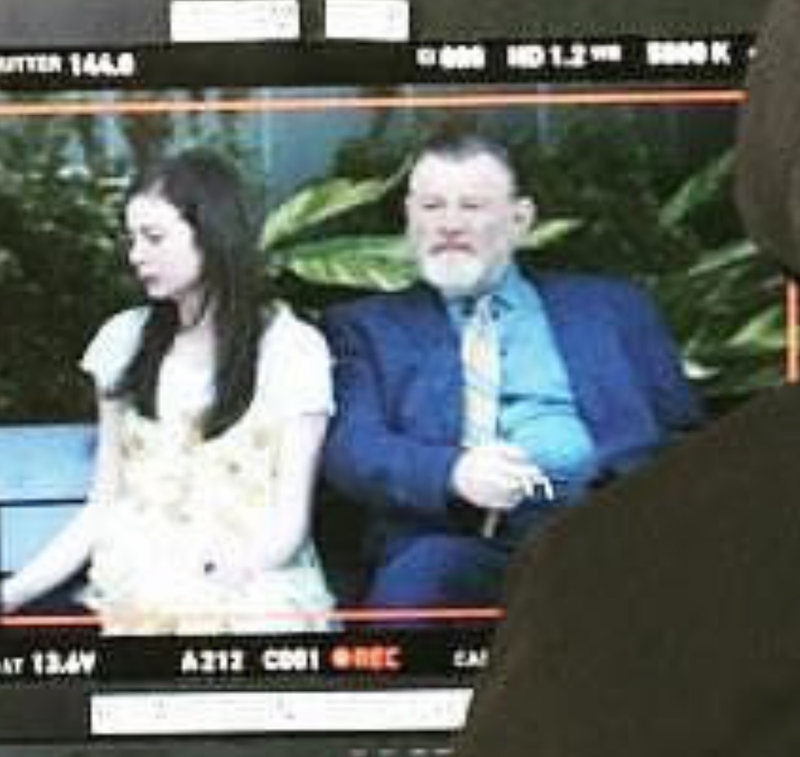 Here is a new photo from the set of Mr Mercedes. 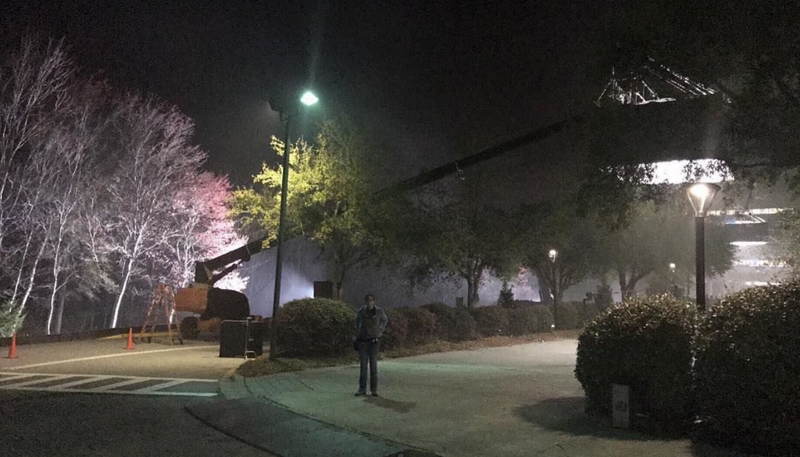 Here are two more photos from the set of Mr Mercedes. 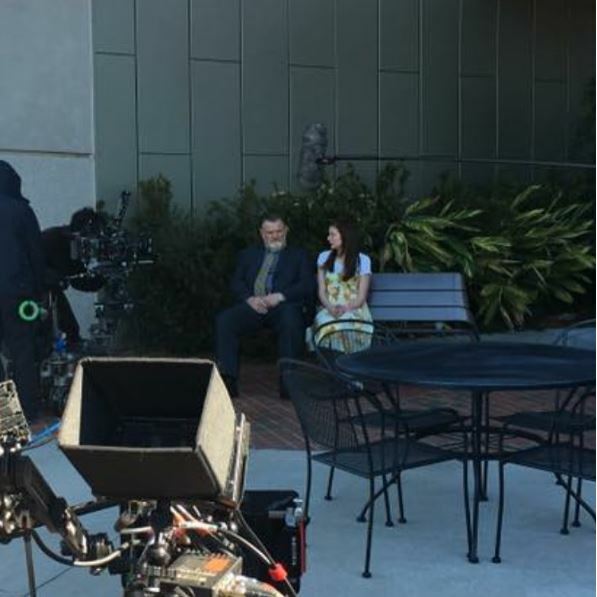 Two more photos from the ser of Mr Mercedes. 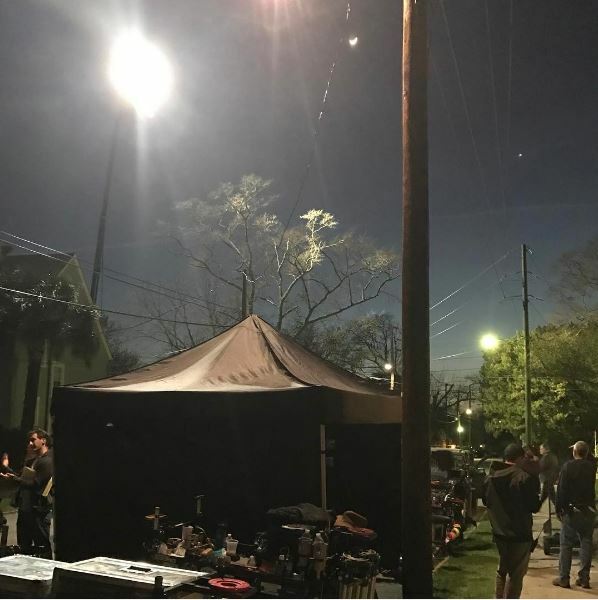 Here are two more behind the scenes photos from Mr Mercedes and while the second might be hard to place there should be no doubt what scene is being filmed in the first if you have read the book and also seen the photo I posted yesterday. 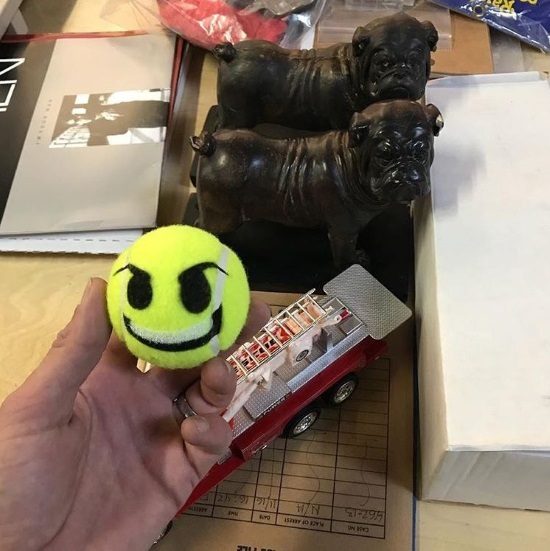 Here are two photos from the set of Mr Mercedes. 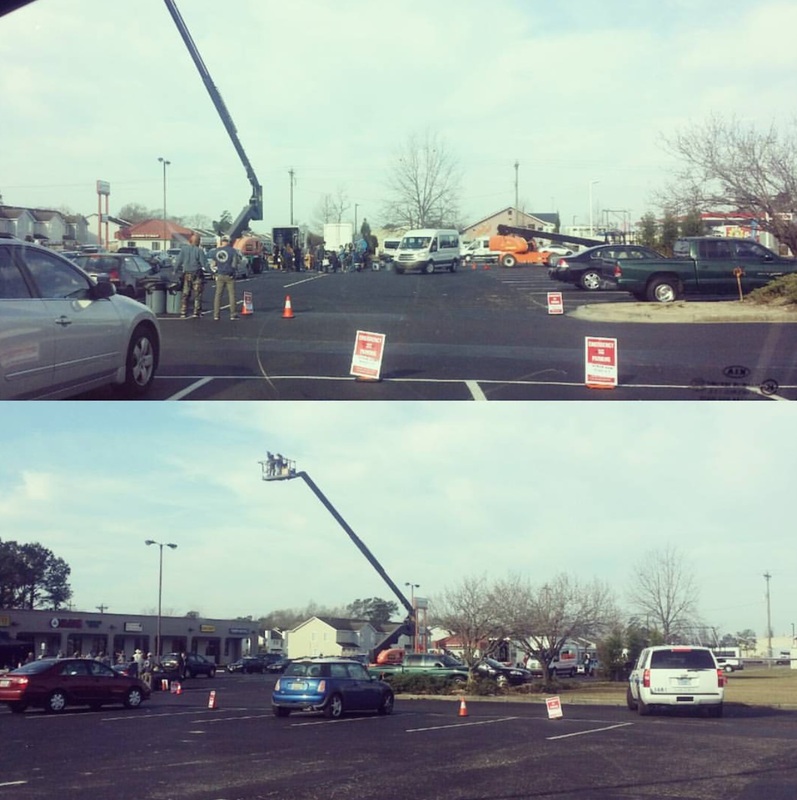 Filming of Mr Mercedes was done at Little Jack's on Wednesday. The crews chose a good rainy day to shoot, since the set included spouts for staged rain. Props and lighting was also set up alongside the forthcoming Pancito and Lefty building. Police directing traffic said that shooting was set to continue into late afternoon. Little Jack's Tavern said they were closed for today only for filming. Here's an interesting casting call for Mr Mercedes. Please note that it contains spoilers though so read at your own risk. 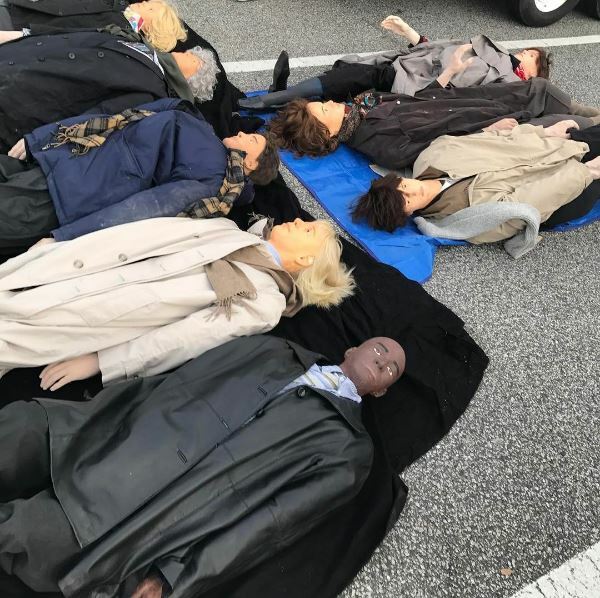 Extras casting call for the Charleston filming of "Mr. Mercedes"
MR. MERCEDES, the TV series based off the Stephen King Novel, is seeking over a 100 PAID Extras for a Job Fair Massacre scene. Adult Males and Females (18 yrs & up) are needed for filming - Wednesday, February 22nd thru late morning of Saturday, February 25th. 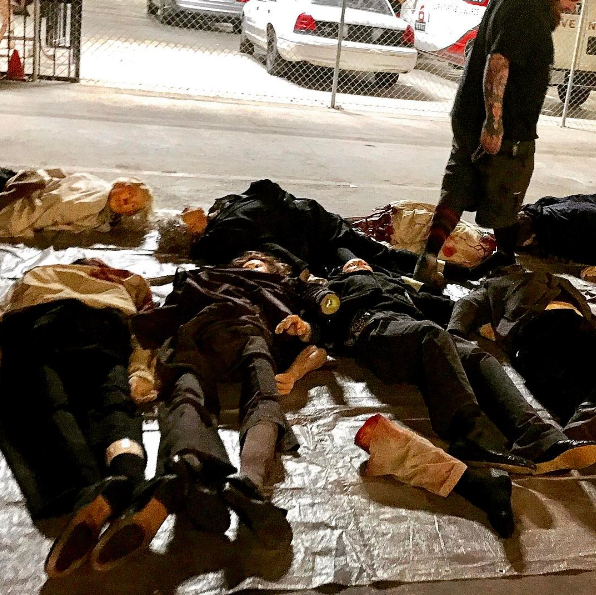 These scenes will be filmed dusk till dawn each date. 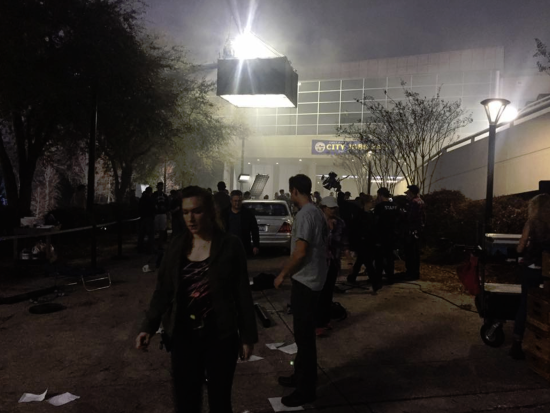 Filming in the North Charleston, SC area. Only those available ALL 3 dates and comfortable with the hours needed should submit for this filming request. Those available and interested in being considered should submit a current photo (which can be taken with a cell phone, name, phone, age, height/weight, clothing sizes, color/make/model/year vehicle you drive and City/State you reside. Submissions should be sent to mrmercedesrequest@gmail.com with heading being 3 Dates Avail. Production is also in need those with vehicles from 1995 - 2009. Anyone with such vehicles may be needed for 4 dates of filming - Tuesday, February 21st thru late morning of Saturday, February 25th. 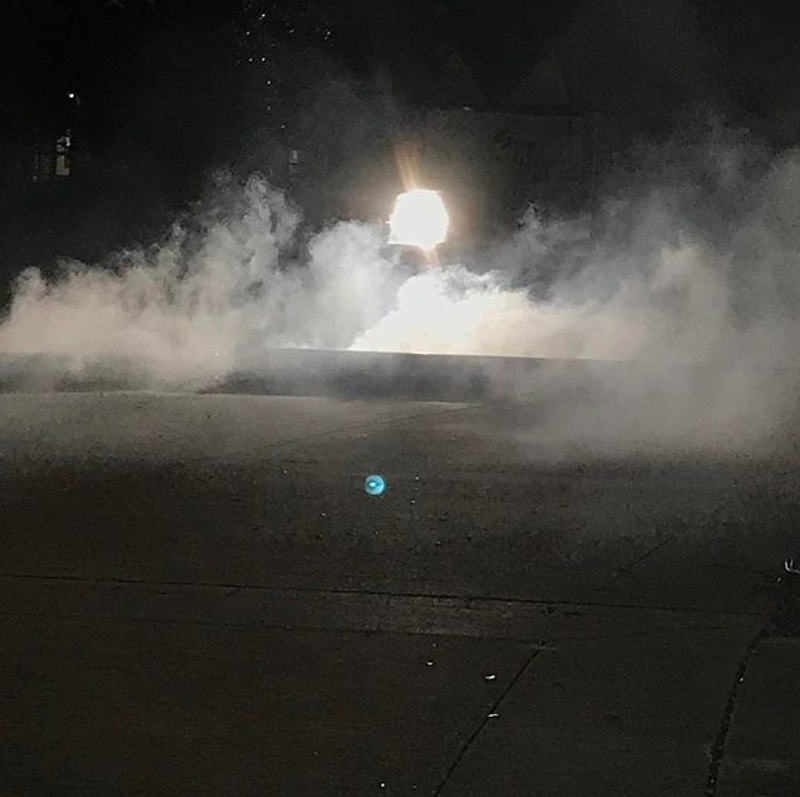 Those familiar with the Mr. Mercedes novel will understand the importance of this filming sequence is to the series. 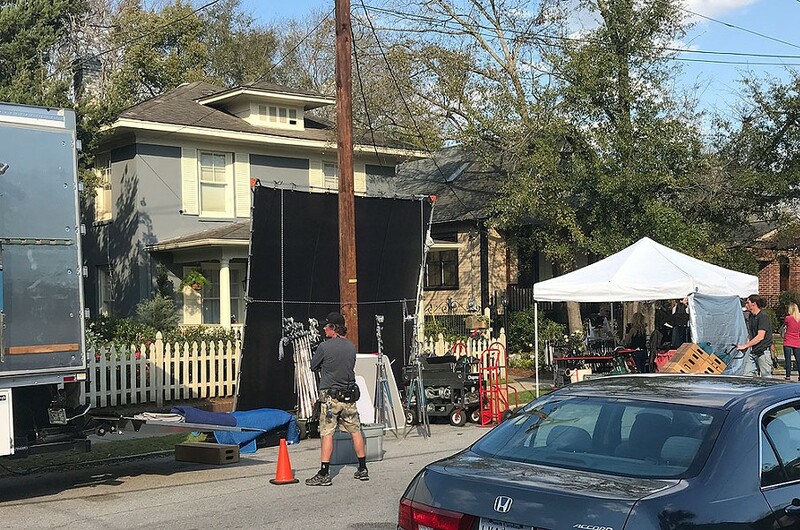 Mr Mercedes continues filming in Charleston. 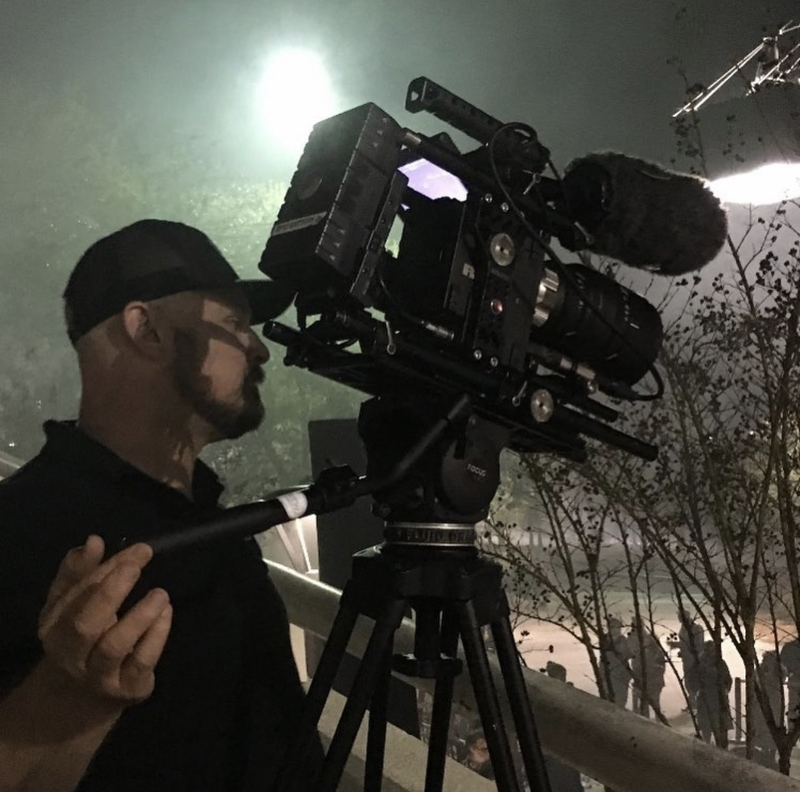 Many people in Charleston have posted about production crews in the area over the last few weeks. 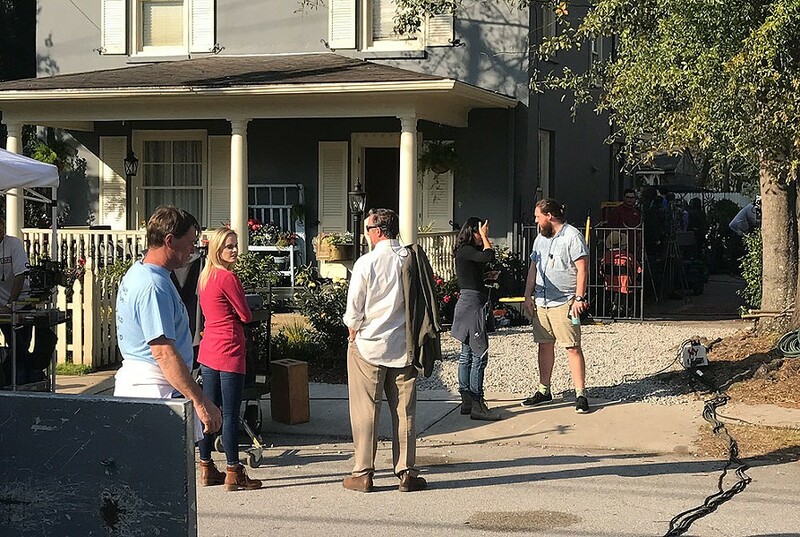 Thursday Beau Schuling, the publicist for the production, said crews will be filming in the greater Charleston area through May. 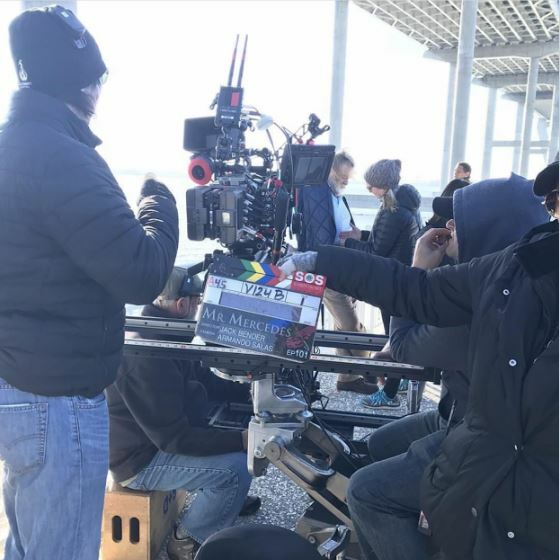 Schuling said filming is happening at sites all over area including Wagener Terrace/Hampton Park, Park Circle, the Cooper River Pier, and the International Longshoremen’s Association Hall on Morrison Drive. One of the major production sites is in Goose Creek off of Red Bank Road. Here are a few articles about it with photos. 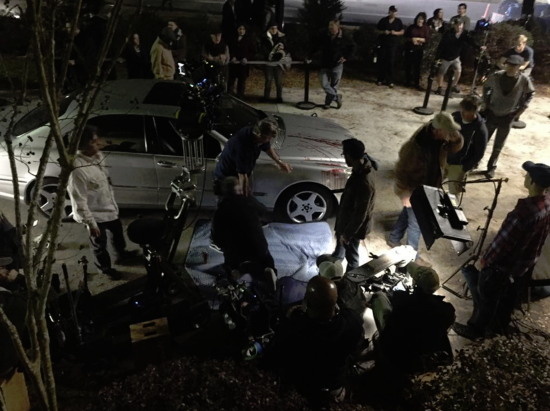 Here is a clip from the set of Mr Mercedes. 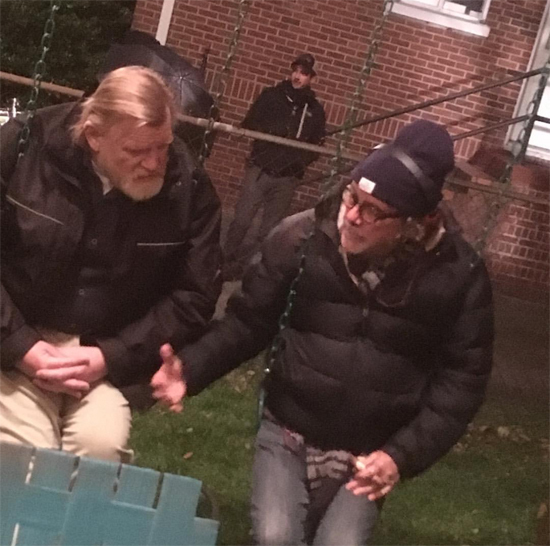 Here is yet another photo from the set of Mr Mercedes. 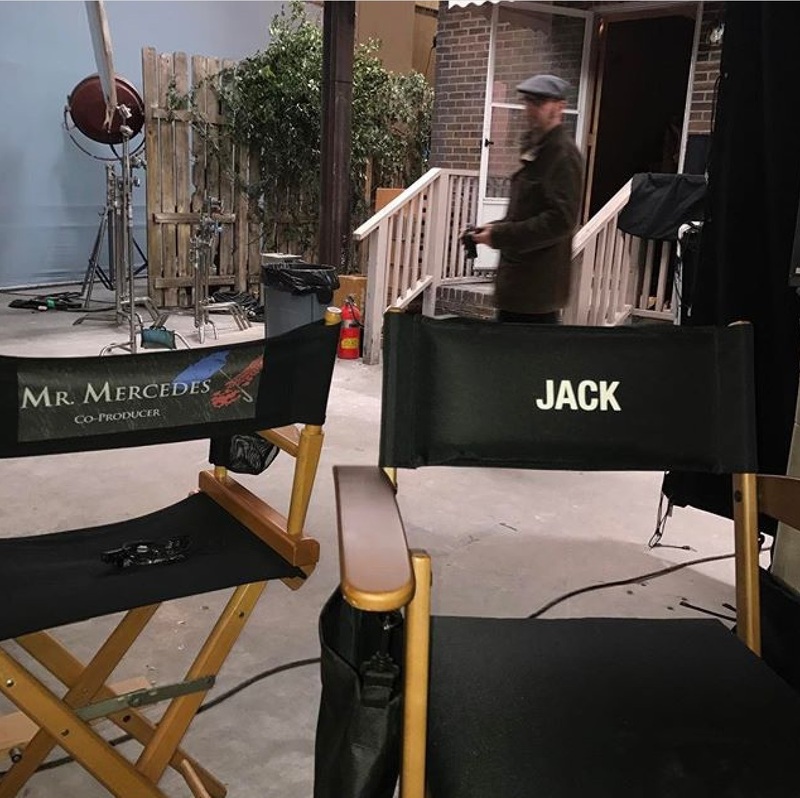 On Instagram mr_mercedestv is keeping us up to date with the filming of Mr Mercedes. 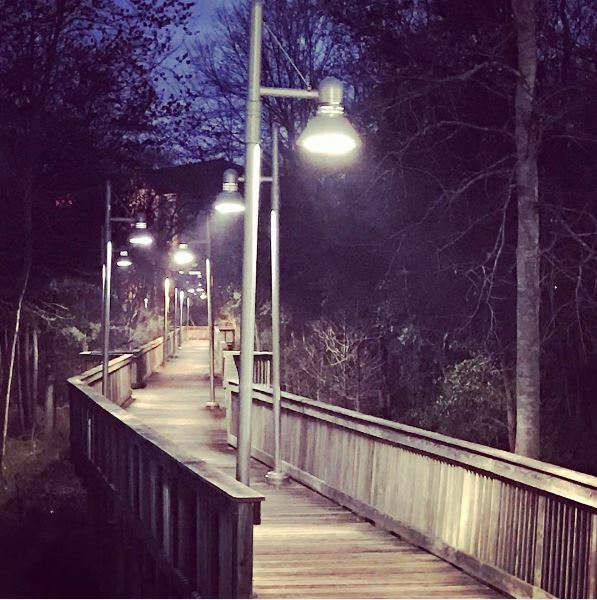 In his last post he mentions that they will film in Goose Creek the upcoming days. So, if anyone is in the area, keep an eye open for them and also, take pictures and send to me. 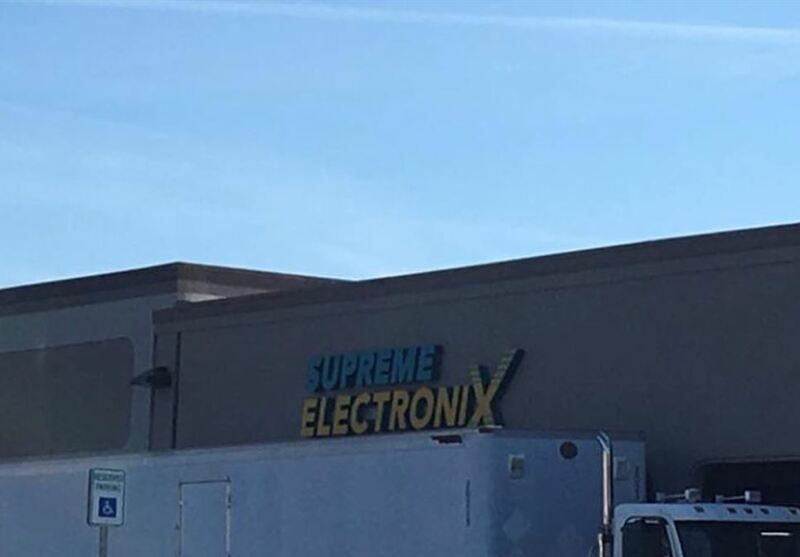 Mr Mercedes is being set up to be filmed in Goose Creek right now. Signs say emergency parking only after 6am 02/07 so it will film tomorrow. A store between Food Lion and Mona’s Wings on Red Bank Rd has been being worked on for about a month. 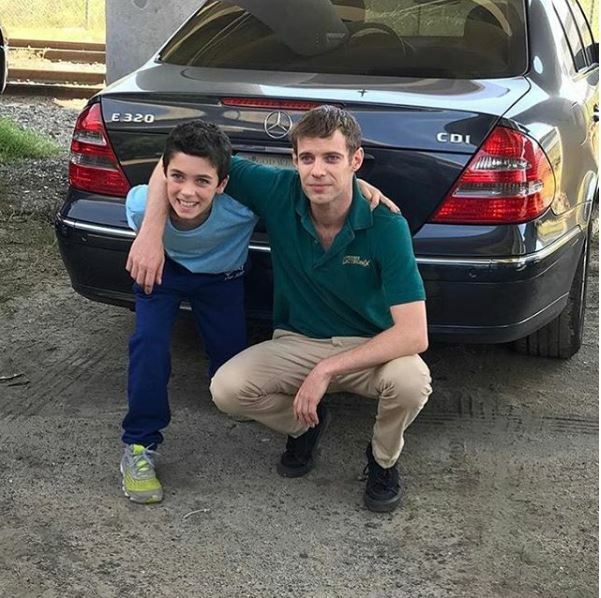 New photo from the set of Mr Mercedes. 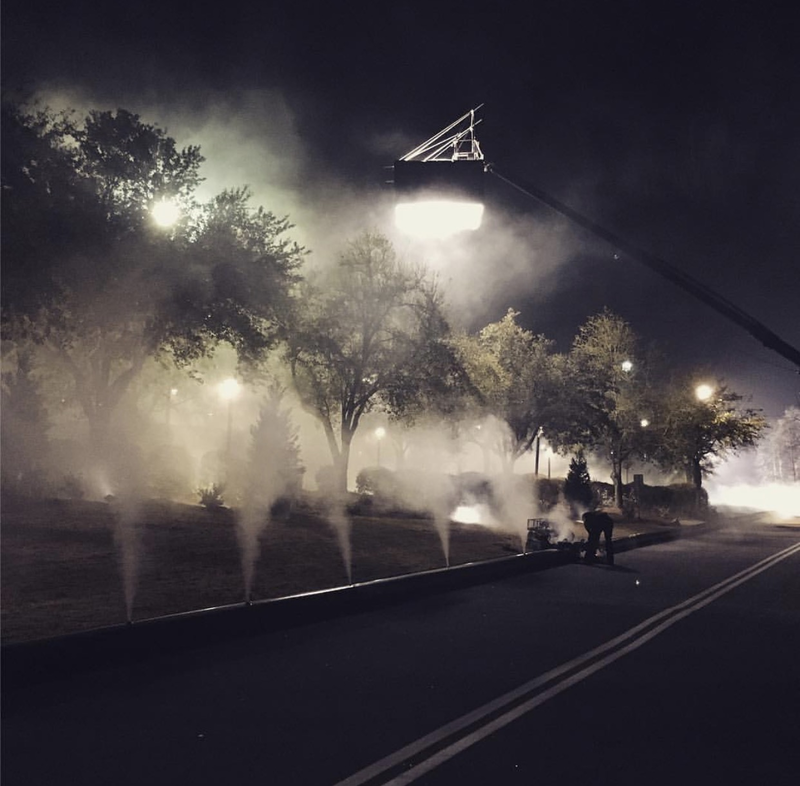 Holy Cinema reports from the set of Mr Mercedes. 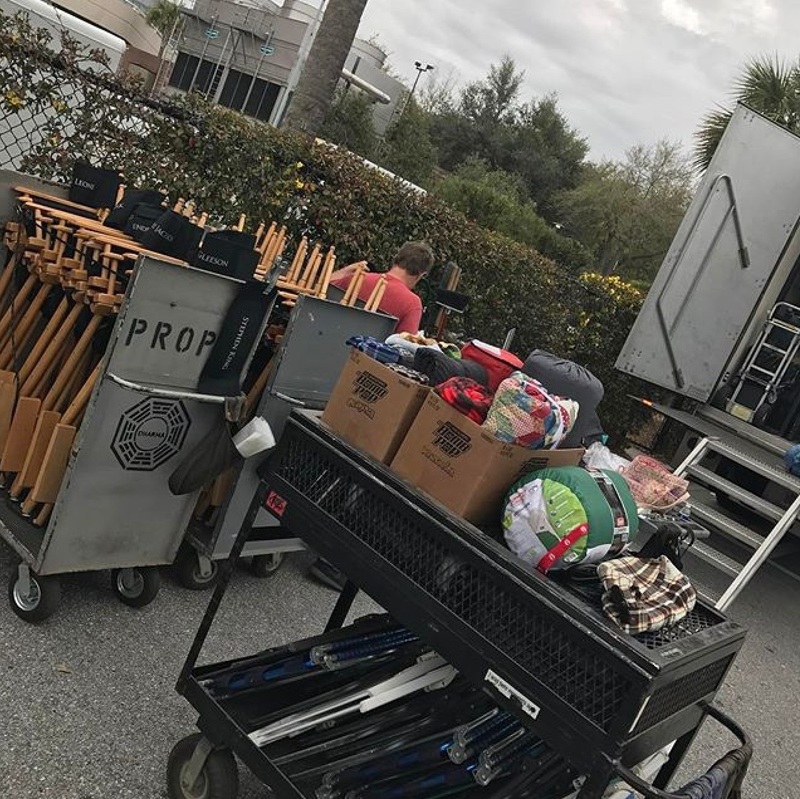 After seeing crew signs and production trucks scattered around the upper peninsula the past few weeks, we ran across the filming of the Mr. Mercedes TV series on Sans Souci Street today in North Central. The show is based on the Stephen King detective novel trilogy. The crew has been filming a few days at a time over the past few weeks, setting up shop downtown at a couple of different locales. Trucks and crews have been seen staging at the Charleston Rifle Club off Heriot Street. If anyone of you live there or close by, go take photos and send them to me. 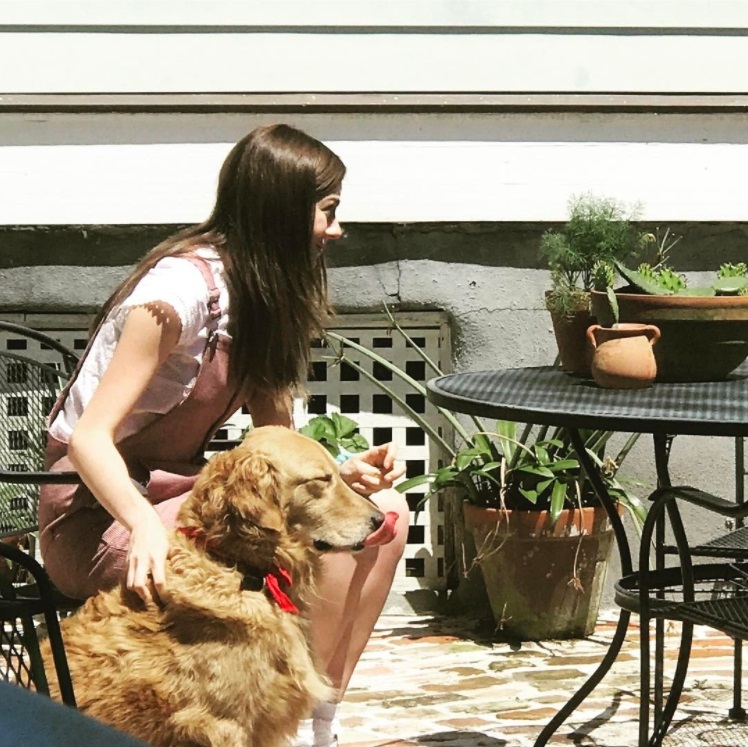 Production on the 10-episode show from Sonar Entertainment is underway in Charleston, SC and according to this article the premiere is slated for this fall. Casting for Mr Mercedes is coming together. Here is a list of what we know so far. 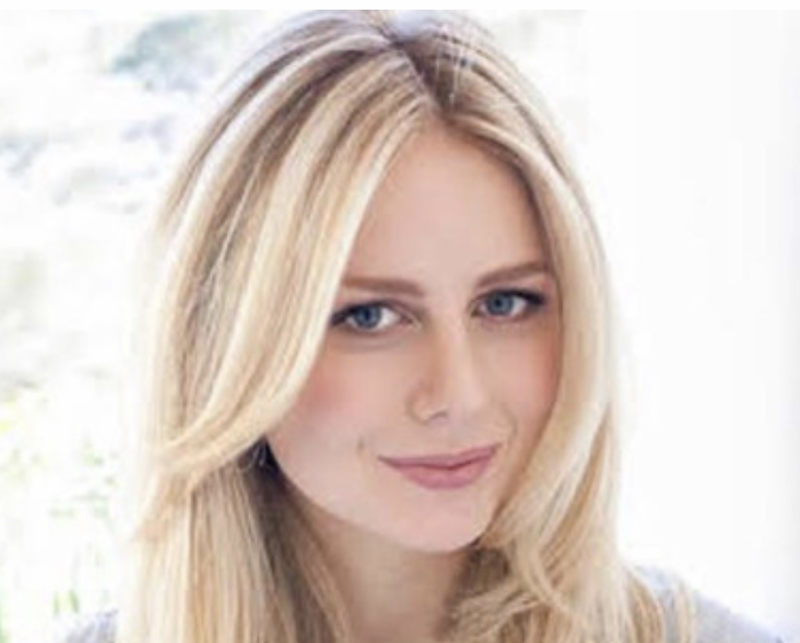 Justine Lupe will play Holly Gibney in the movie version of Mr Mercedes, the younger cousin of Janey and Olivia who has some “issues”: OCD, synesthesia, sensory processing disorder. But she’s also terribly observant, refreshingly unfiltered and unaware of her innocence, which is oddly endearing. 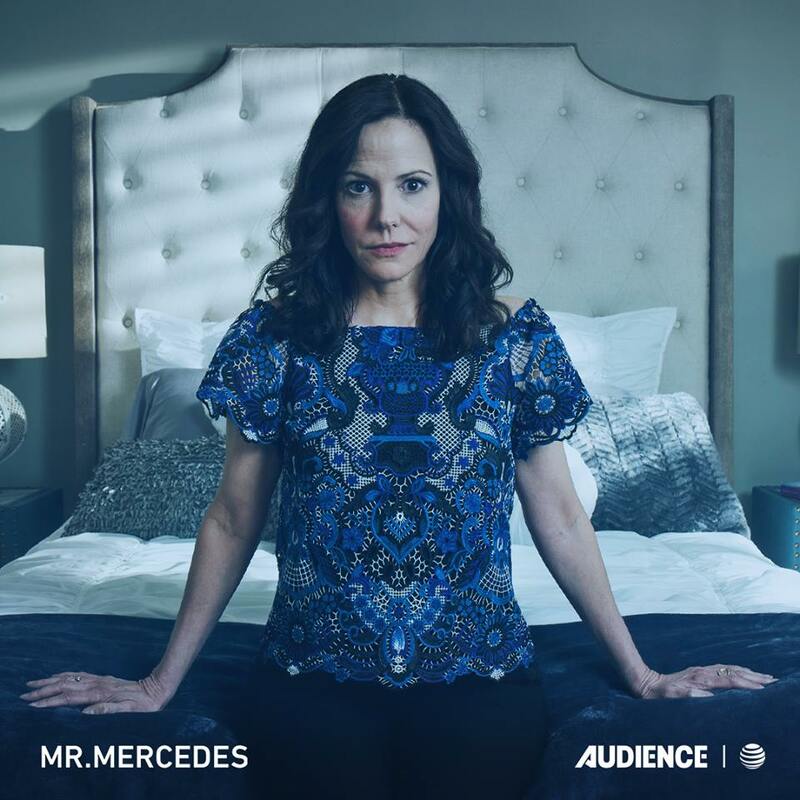 Mary-Louise Parker plays Janey Patterson in Mr Mercedes. Janey is the younger sister of the late Olivia Trelawney. 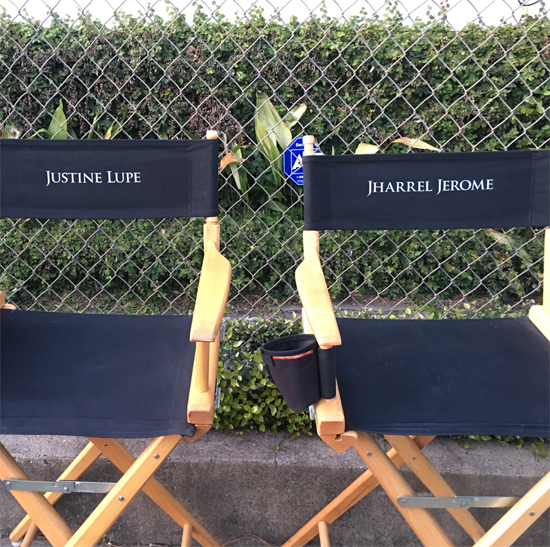 Here are some casting news for Mr Mercedes. 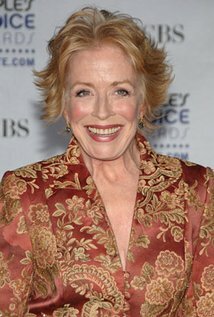 Jharrel Jerome will play Jerome Robinson and Holland Taylor will replace Ann-Margret in the role of the prickly, outspoken, self-serving Ida Silver who is the next-door neighbor of Hodges. Mr Mercedes: TV Series Faithful to the Book? 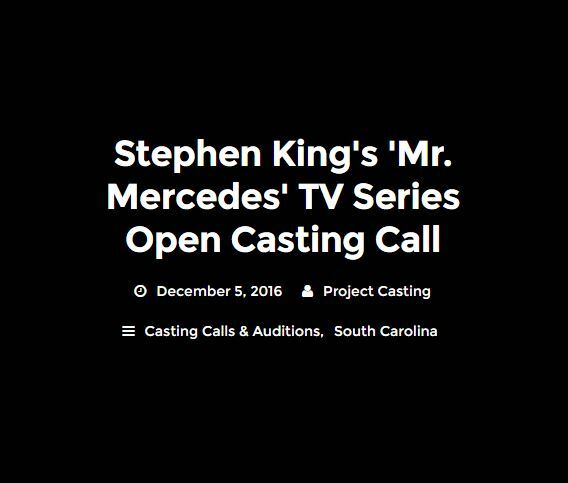 Are the details in the Mr Mercedes casting call an indication that the adaptation will be faithful to the book? The Berkeley Independent reports that an extras casting call for Mr. Mercedes, the next Stephen King work to be adapted to the screen, has finally gone out. What is especially interesting about the call is how specific its requests are. In fact, the level of detail in the casting call may suggest a few things about the plot of the adaptation and how faithfully it will adhere to the Stephen King-penned hardboiled crime thriller it is based on. 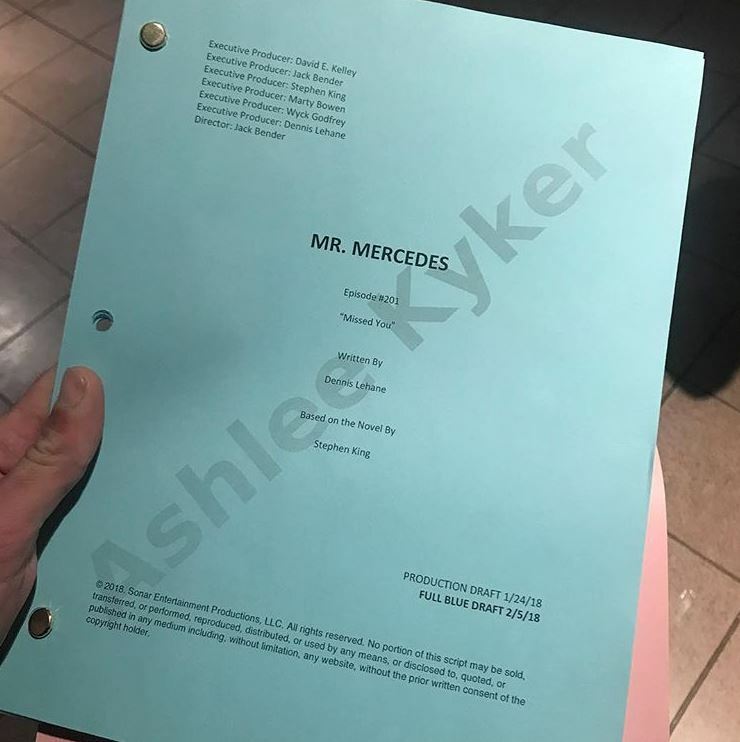 Mr Mercedes is gearing up to start filming. We have confirmation from this casting call that they will be shooting in the Charleston area the week of February 21-24. 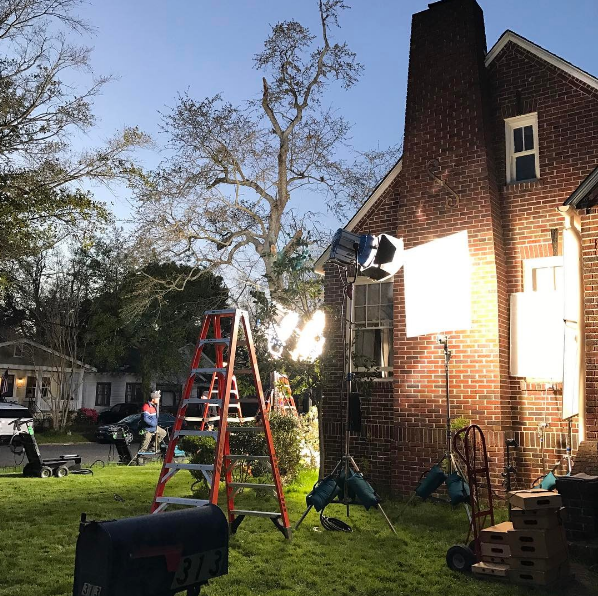 Tona B. Dahlquist Casting is looking for paid extras of "all ages ethnicities and types" for a 10-episode television series being shot in the Charleston area this month. Casting directors are also looking for "a set of twins," Caucasian babies (preferably girls) 7-9 months of age. 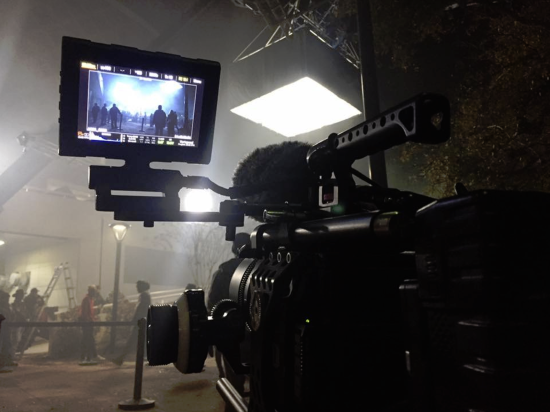 Interested actors should be available for filming multiple days and nights the week of February 21-24. 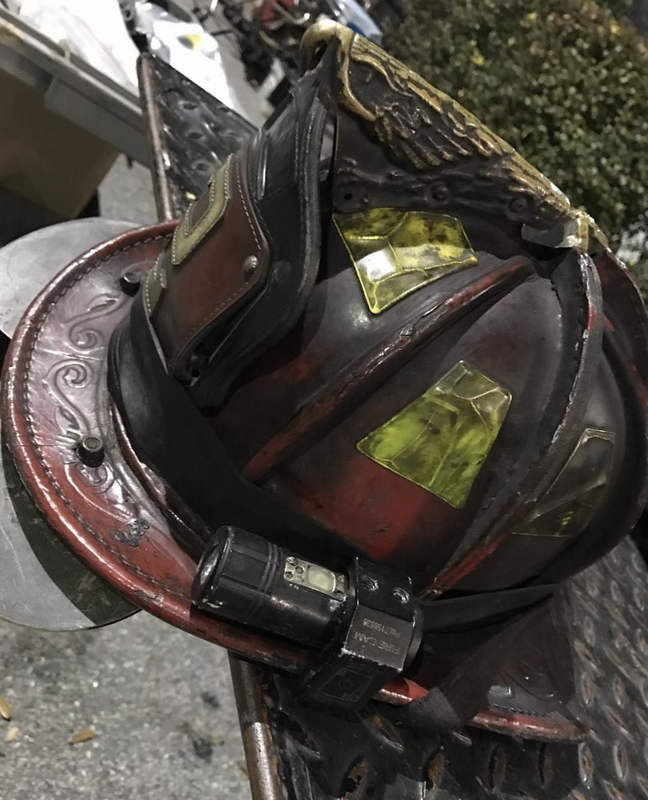 They're also looking for several real police officers, EMTs/ paramedics and firemen as well as anyone who owns a vehicle made between 1990 and 2011. Interested parties can visit the Casting Facebook page for more information as well as updated casting needs. 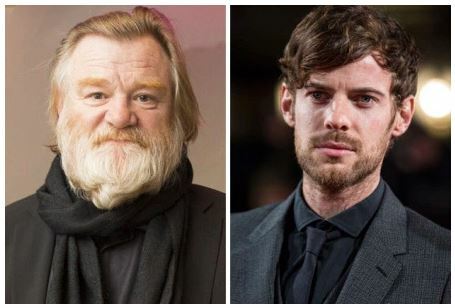 Casting the Audience Network 10-part TV series "Mr. Mercedes," starring Brendan Gleeson, and based on the novel by Stephen King. Project description: "Centers on a demented killer who taunts a retired police detective with a series of lurid letters and emails, forcing the ex-cop to undertake a private, and potentially felonious, crusade to bring the killer to justice before he can strike again. 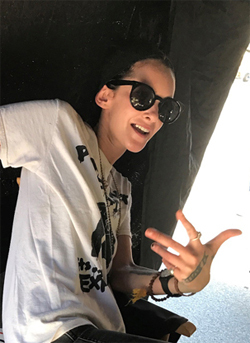 Project will premiere in 2018 on Audience Network, a joint venture of AT&T and DirecTV." Ann-Margret has been cast in Mr Mercedes and will play the next-door neighbor of Bill Hodges. Ann-Margret will play will play Ida Silver, the next-door neighbor of Gleeson's Det. Bill Hodges. Ida doesn't miss much and is a real piece of work: prickly, outspoken, self-serving, intimidating and vulnerable. Best known for film roles such as Bye Bye Birdie, Viva Las Vegas, Tommy and Grumpy Old Men, Ann-Margret's TV credits include Ray Donovan, CSI and Law & Order: SVU, for which she won an Emmy. She is repped by ICM and AM Productions & Management. Deadline reports that Kelly Lynch has been cast in Mr Mercedes. 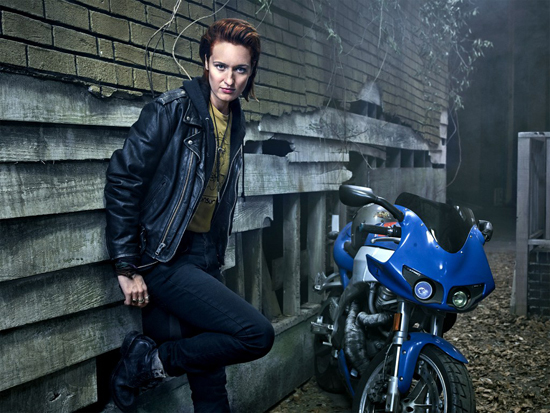 Kelly Lynch has landed a key role in Mr. Mercedes, AT&T Audience Network’s upcoming drama series. 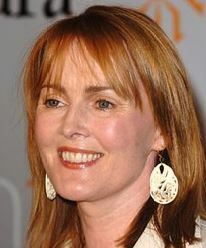 Lynch will play Deborah Hartsfield, Brady Hartsfield's complicated mother. Despite her troubles, Deborah tries to have a normal relationship with her deeply troubled son but she is rarely successful. Great casting if you ask me. 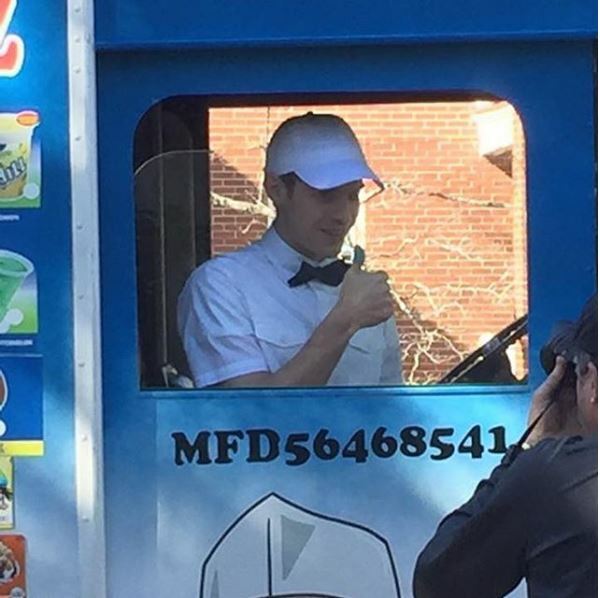 Mr Mercedes is going to be filmed in Charleston. 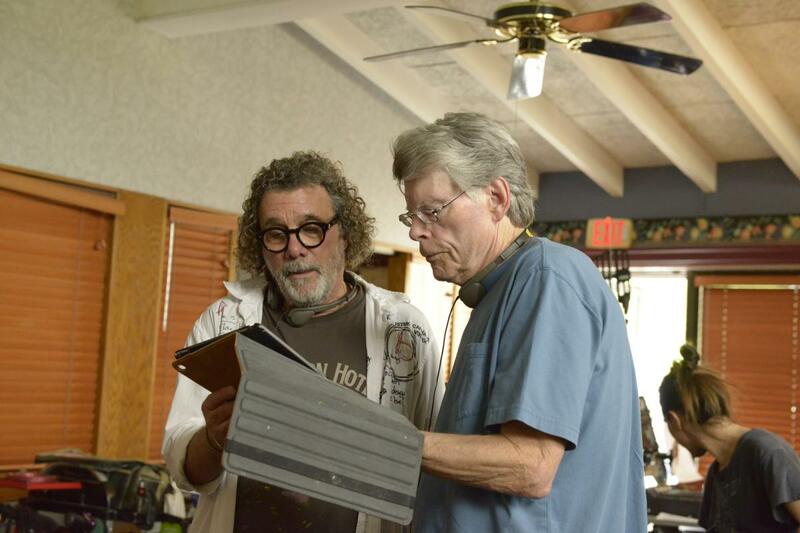 Stephen King's 2014 novel "Mr Mercedes," a police thriller and the first of the best-selling author's Bill Hodges Trilogy, will be made into a 10-episode TV series to be shot in Charleston starting early next year. The book was adapted by showrunner David E. Kelley and produced by Sonar Entertainment, according to the Hollywood Reporter. It will star Brendan Gleeson (HBO's "Into the Storm") and premier in 2018 on DirecTV and AT7T Uverse. Executive producers are Kelley and Jack Bender. The production team currently is looking for background extras and stand-ins. For information, go to their site. Mr Mercedes series is moving forward. 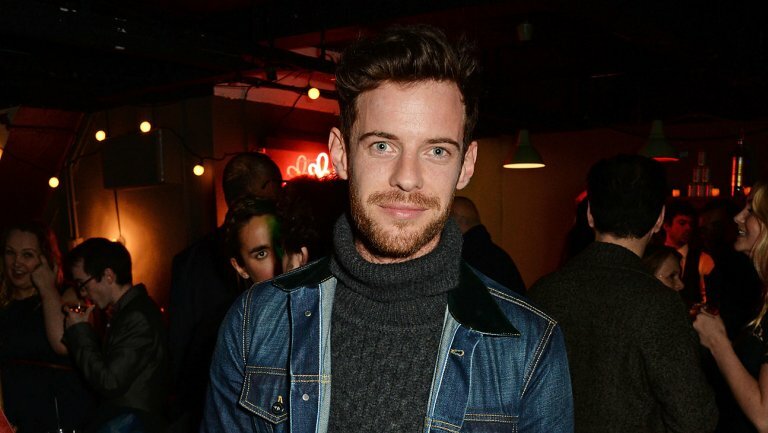 Harry Treadaway will replace the late Anton Yelchin as Brady Hartsfield. The series is slated for a 2018 debut on DirecTV and AT&T U-verse. David E. Kelley's series adaptation of Mr. Mercedes is moving forward. The forthcoming AT&T Audience Network drama has tapped Penny Dreadful grad Harry Treadaway to replace the late Anton Yelchin, The Hollywood Reporter has learned. Treadaway will play Brady Hartsfield, a mentally deranged ice cream truck driver and IT worker who is secretly the Mercedes Killer. 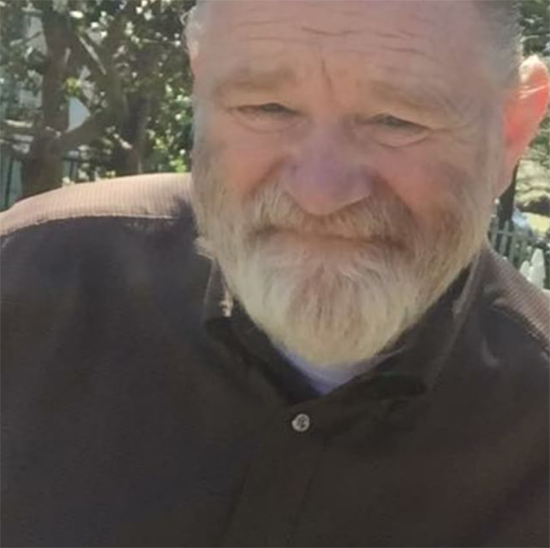 He will star opposite Brendan Gleeson, who will portray Detective Bill Hodges, a retired cop driven out of retirement when an old nemesis reappears. The adaptation received a straight-to-series order in May with Yelchin and Gleeson attached. However, the Star Trek actor was tragically killed in a car accident the following month. He was 27 years old. Kelley will serve as showrunner on the series, which is being produced by Sonar Entertainment. Jack Bender (Lost) is set to direct. 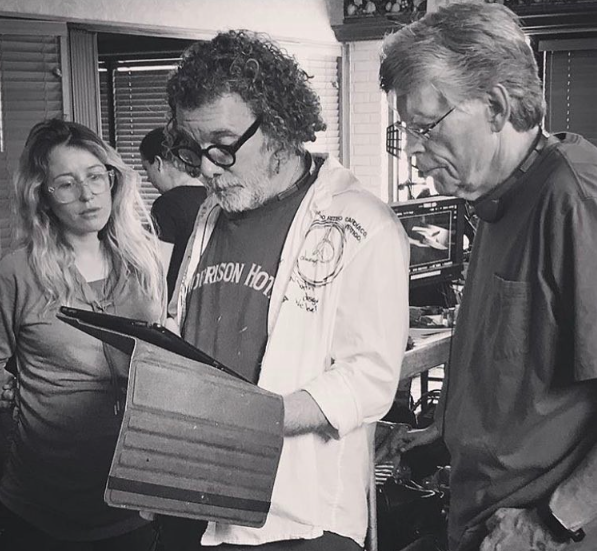 The duo will executive produce with Temple Hill Entertainment's Marty Bowen and Wyck Godfrey. Mr. Mercedes is slated for a 2018 debut on DirecTV and AT&T U-verse. How well do you know the Bill Hodges Trilogy? Take the test here. Steve's choice for Holly has always been Mary Lynn Rajskub, who I think would be great in that part. Will be interesting to see if that works out. I think she would be perfect! Hollywood Reporter reports that the TV Series will run as a 10-episode series on AT&T's Audience Network. 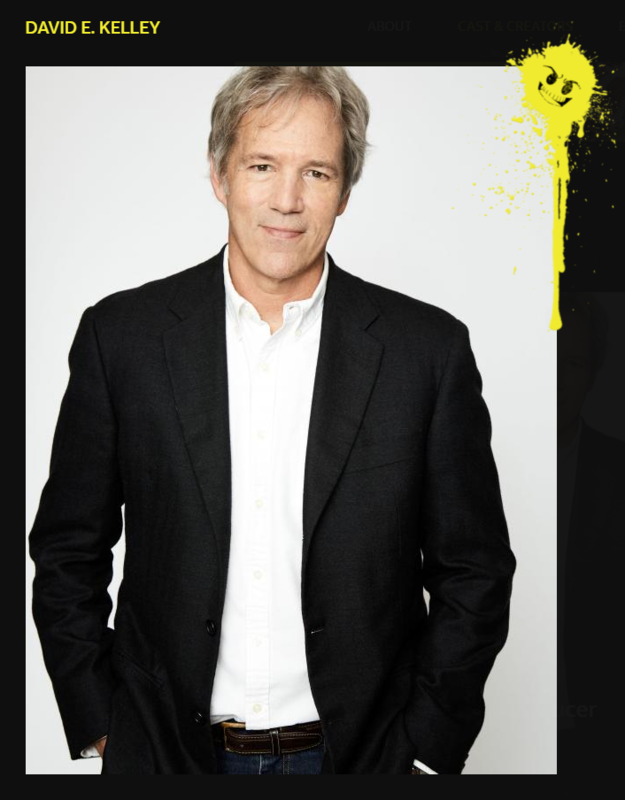 David E. Kelley (Boston Legal, Ally McBeal, The Practice) and Jack Bender (Lost, Under the Dome) will executive produce the series, with the former set to write the first episode and serve as showrunner. 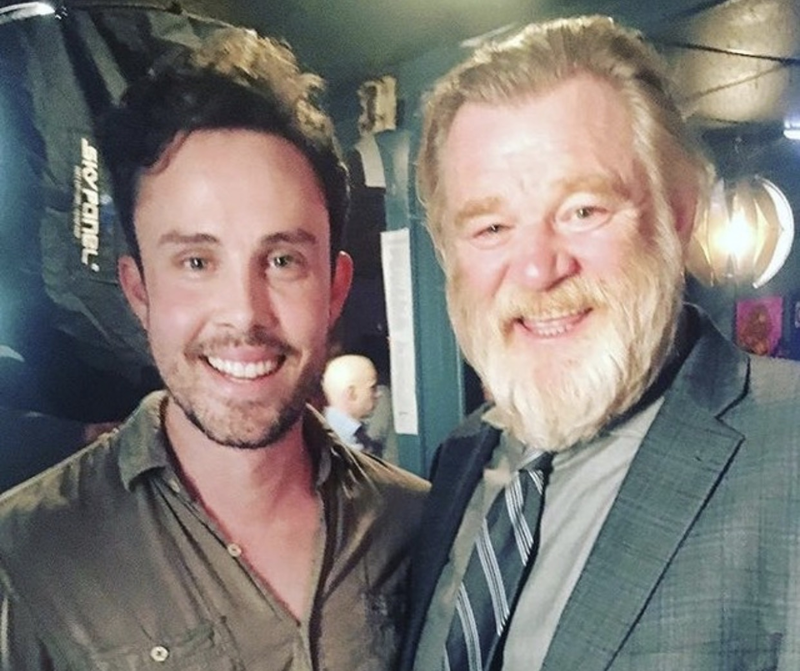 Brendan Gleeson and Anton Yelchin have been tapped to star in the drama produced as Detective Bill Hodges and Brady Hartsfield. No word on other casting yet. When asked about the status on the Mr Mercedes TV show the moderator of King’s board had the following to say. The last I heard from Stephen a month or so ago was that it had been back-burnered so don't expect to see it anytime soon. Here is an update about the limited TV series based on Mr Mercedes. We know from earlier that the plan is to do 10-episodes. No word on when we can expect to see it yet though. David E. Kelley is plotting his return to the small screen. 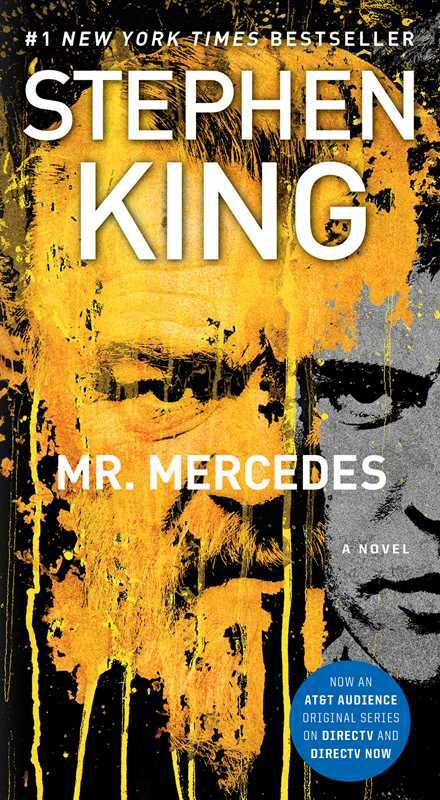 The prolific producer, who most recently showran CBS' The Crazy Ones, has signed on to adapt Stephen King's best-selling novel Mr. Mercedes as a limited series. 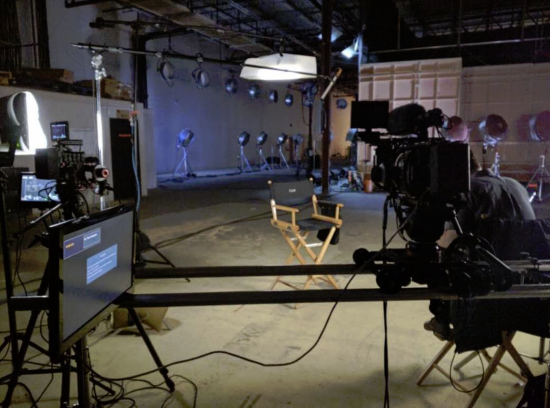 Sonar Entertainment will package the drama as a limited series, with Kelley (Boston Legal, The Practice) attached to pen the script. Lost's Jack Bender will direct and exec produce alongside Kelley, Temple Hill Entertainment's Marty Bowen and Wyck Godfrey, and Sonar's Gene Stein. 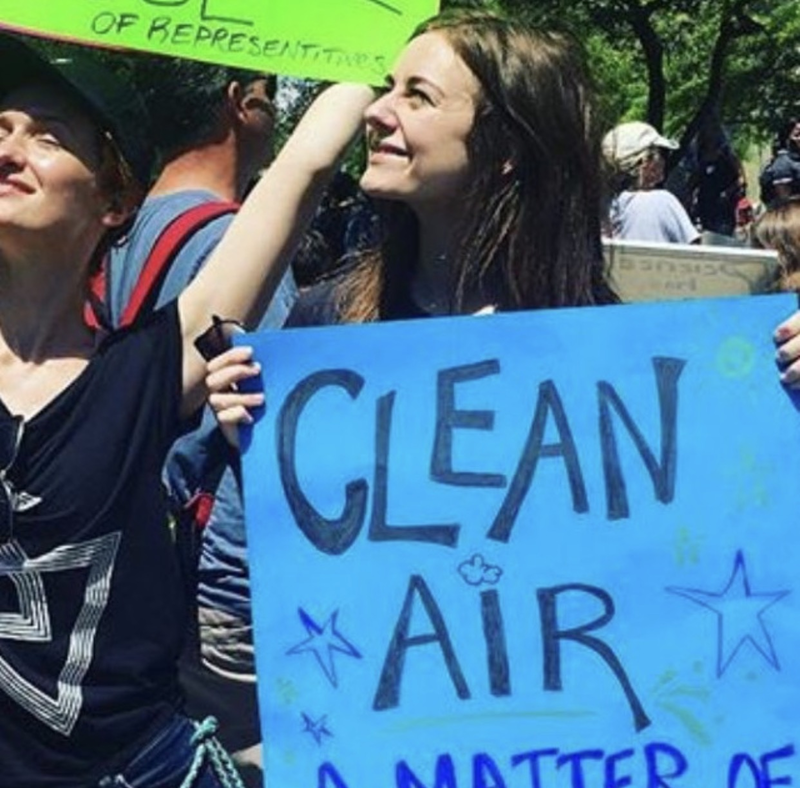 The project marks a reunion for King and Bender, who most recently teamed on CBS' summer drama Under the Dome. 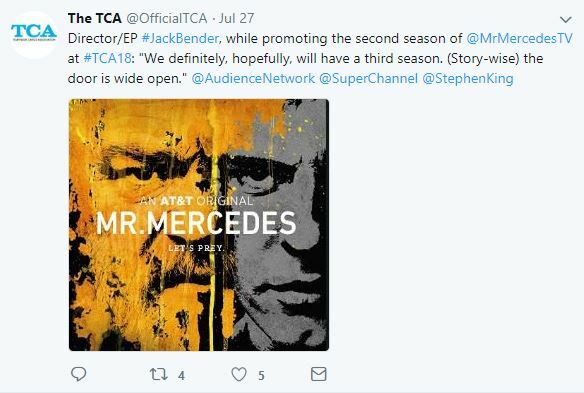 The Moderator on King's official board revealed that Mr Mercedes will be turned into a 10-episode TV series with Jack Bender on the production team.